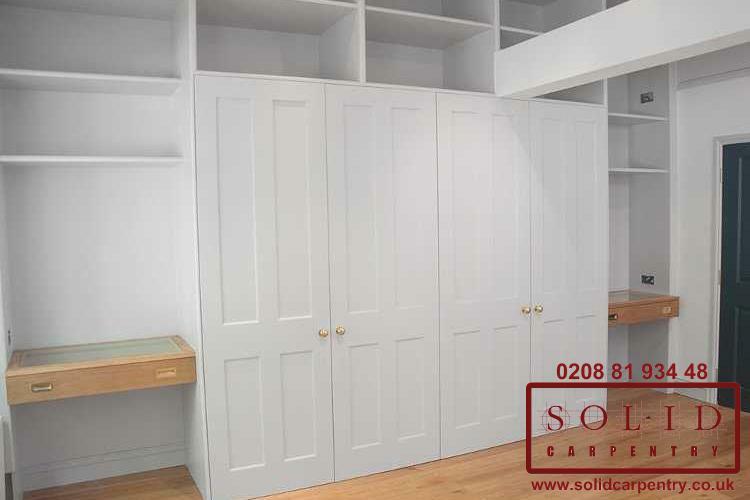 Imagine waking up and opening the doors to a bespoke fitted wardrobe that has been designed to your exact requirements. 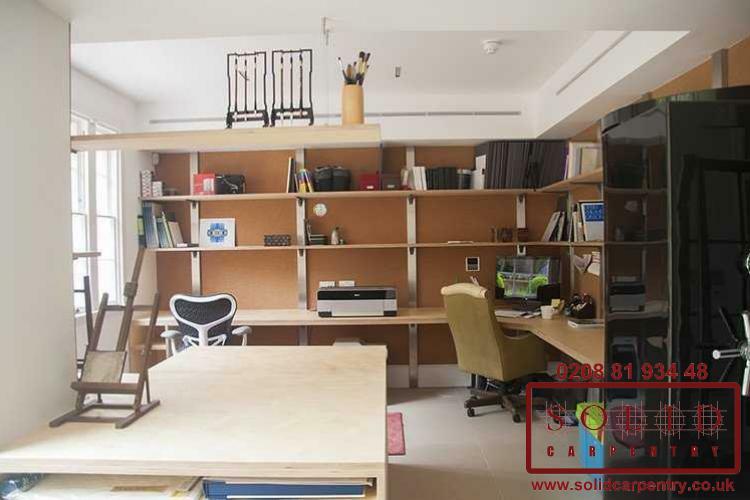 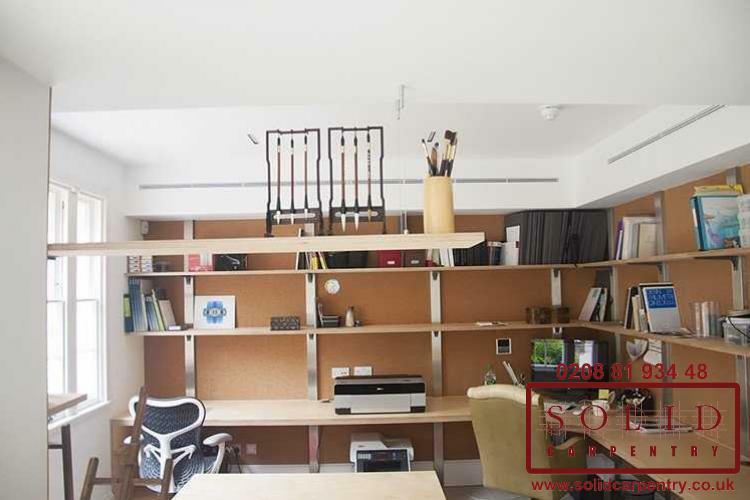 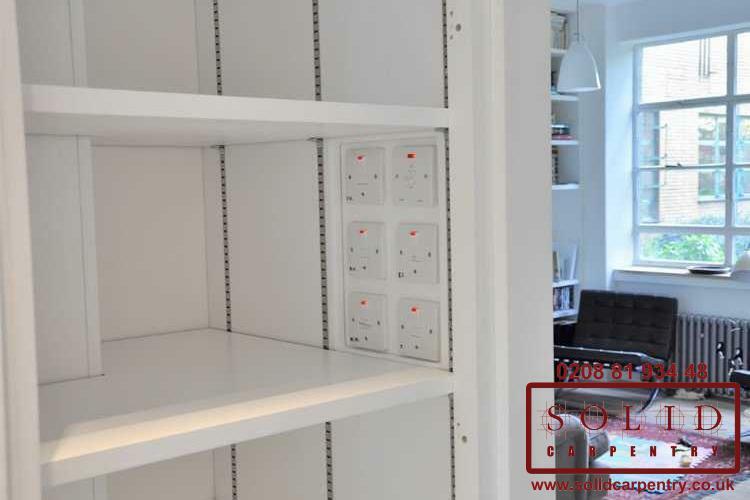 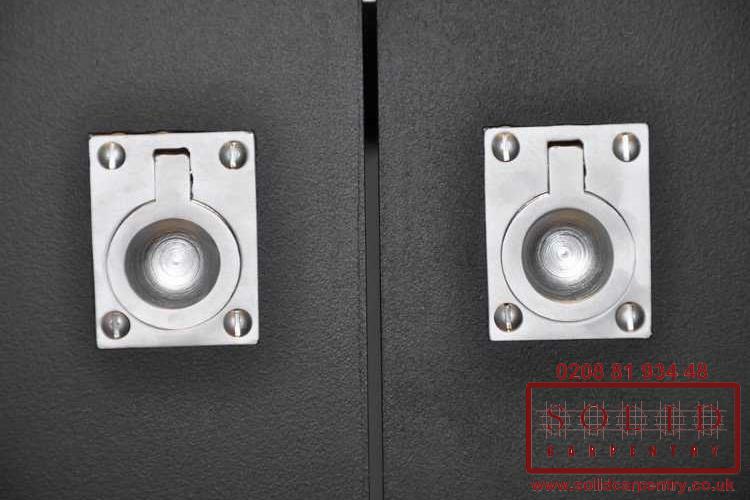 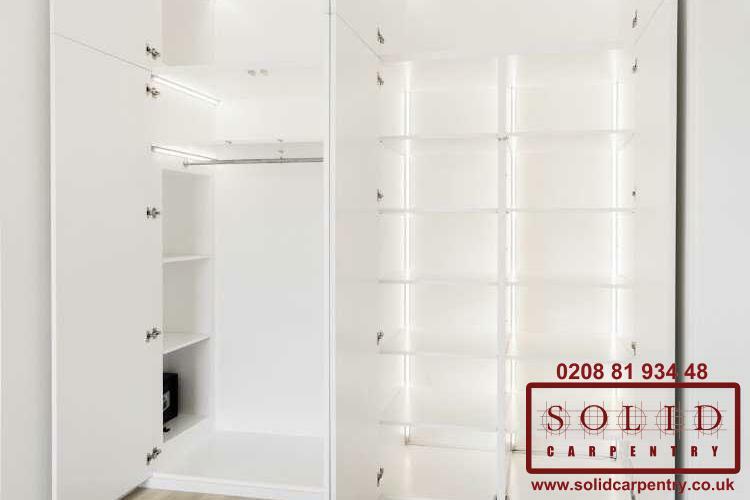 Imagine having enough hanging space; as much, or as little, shelving space as you like; drawers in a size and shape that ensures you can store all your belongings, and all in one unit. 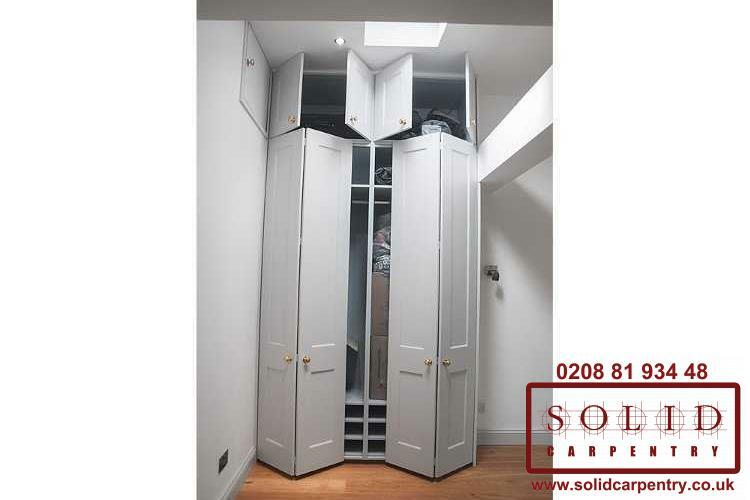 With a built-in bespoke wardrobe the possibilities are unlimited. 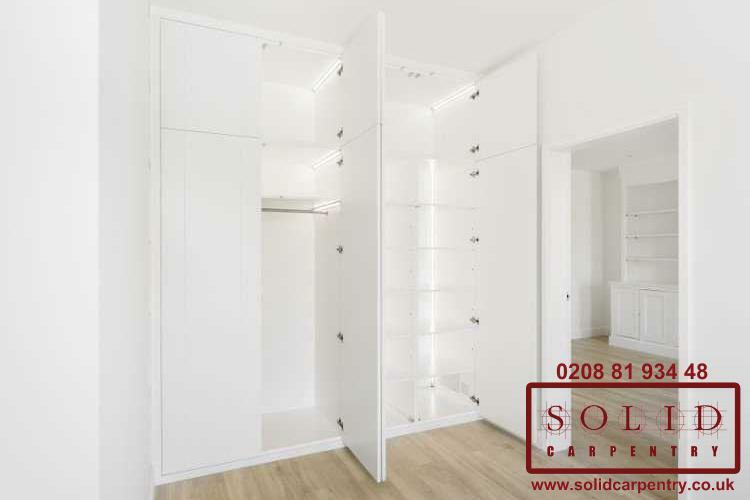 Integrated shoe racks, hidden safes, pull out desks – our team of highly skilled carpenters can create the wardrobe of your dreams! 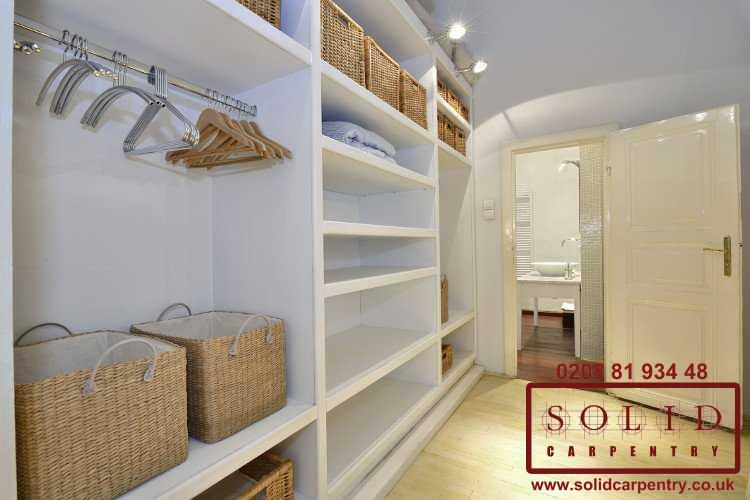 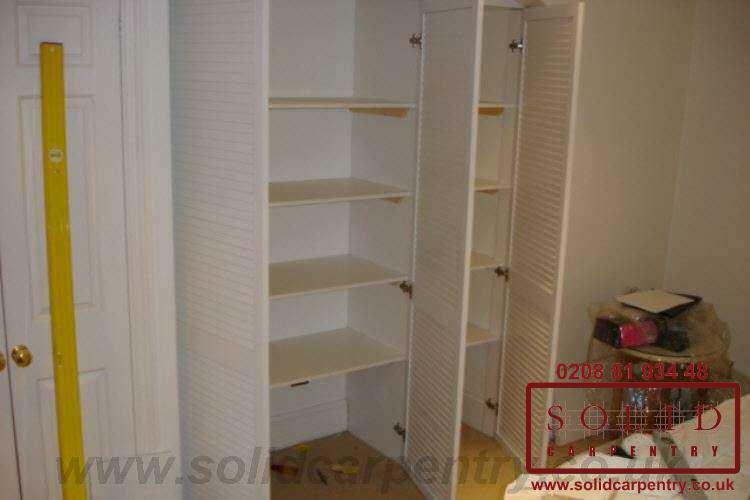 Built-in wardrobes not only offer you more home storage space, they can also transform the look of your room. 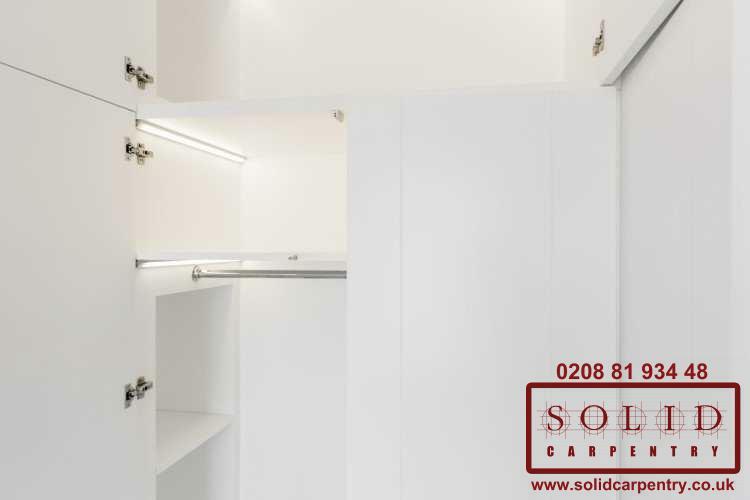 Using the exact layout and dimensions of the available space, fitted wardrobes look neat, stylish, and help to organise even the untidiest of rooms. 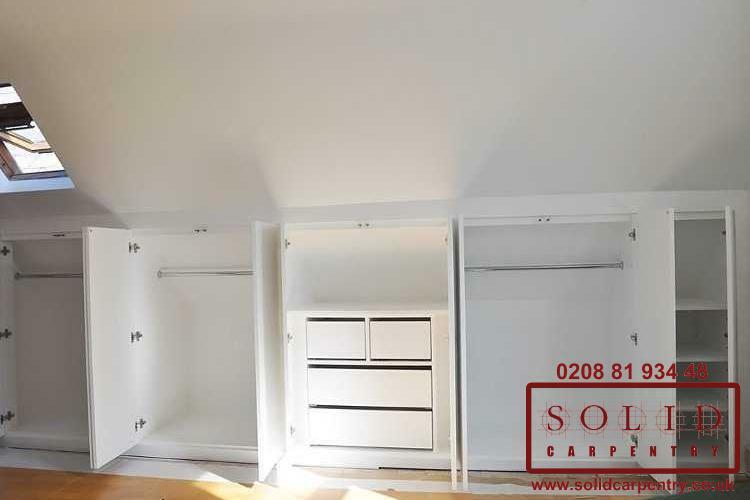 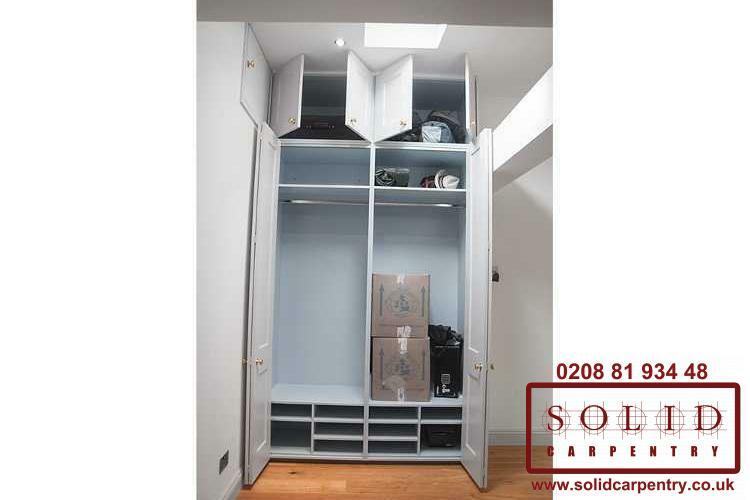 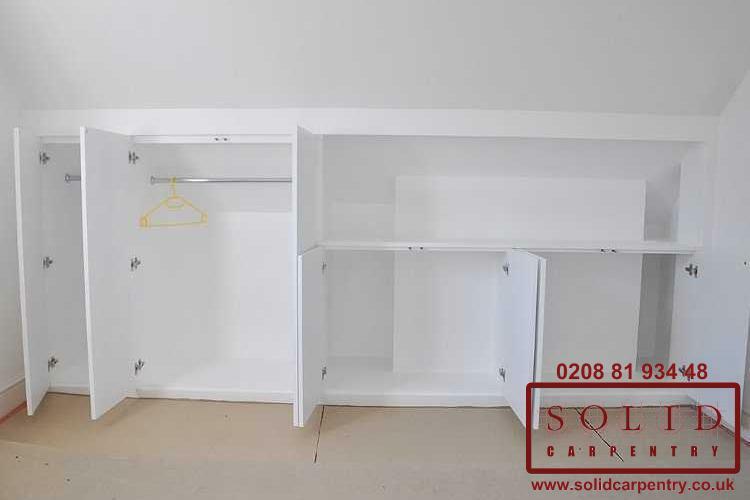 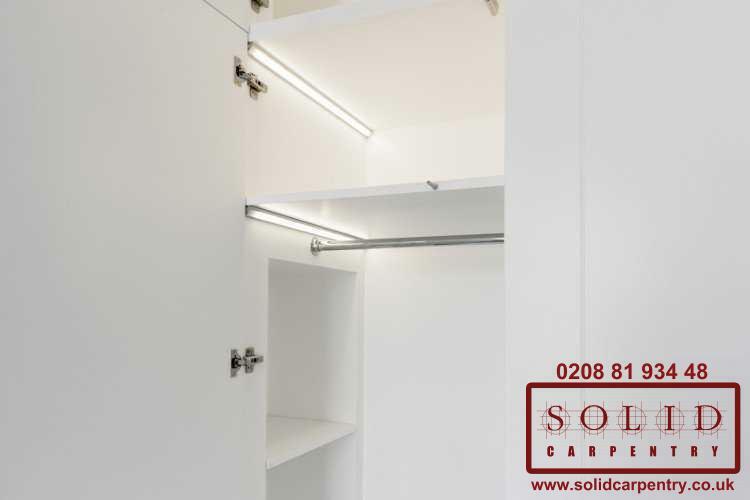 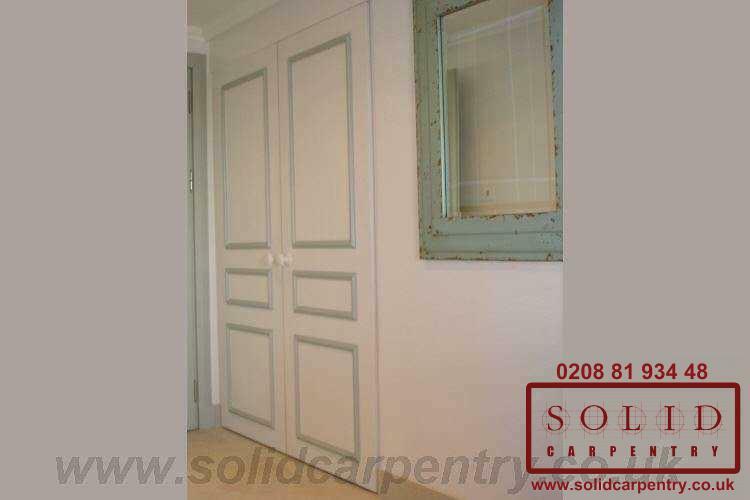 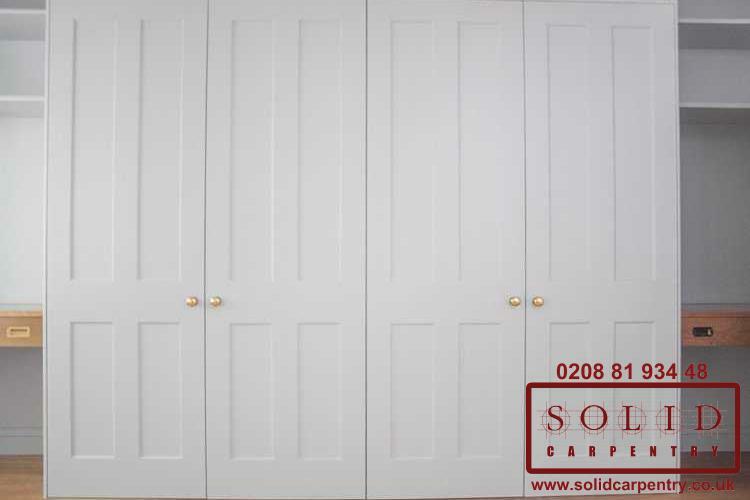 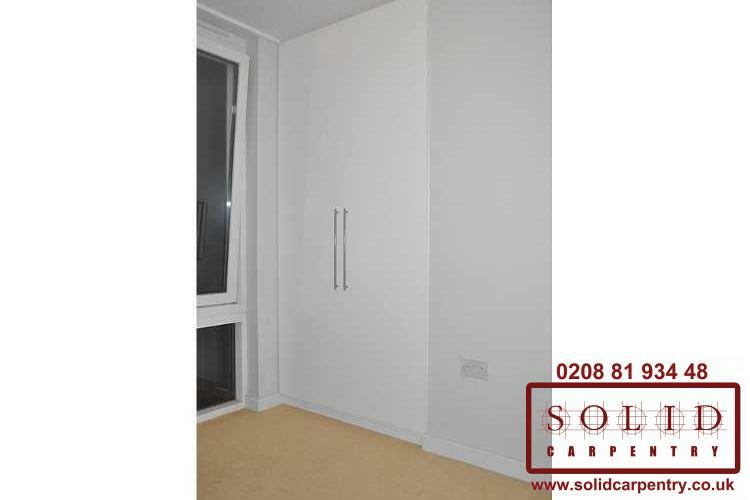 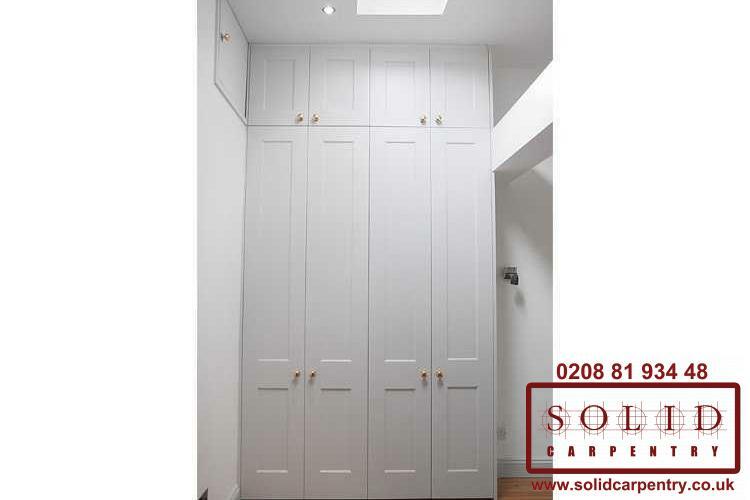 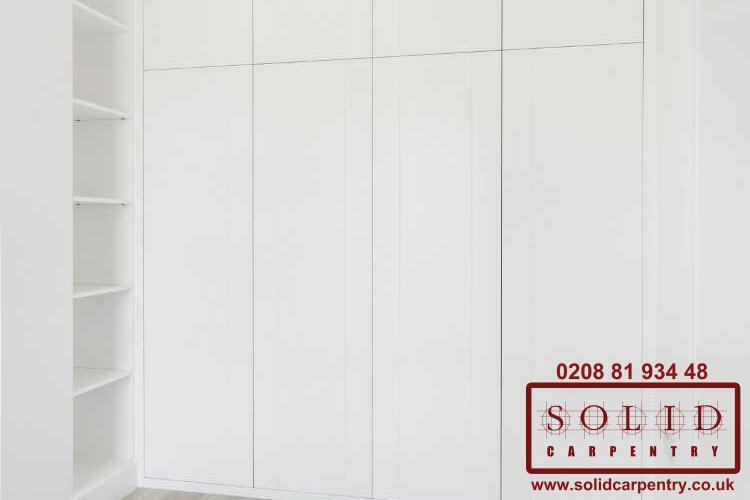 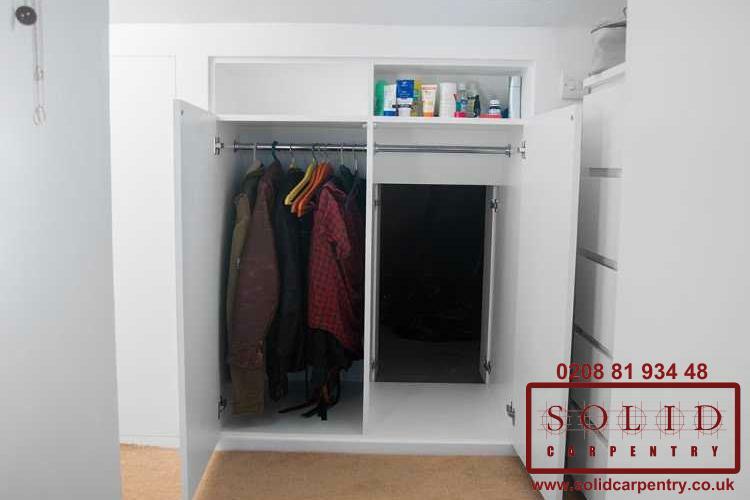 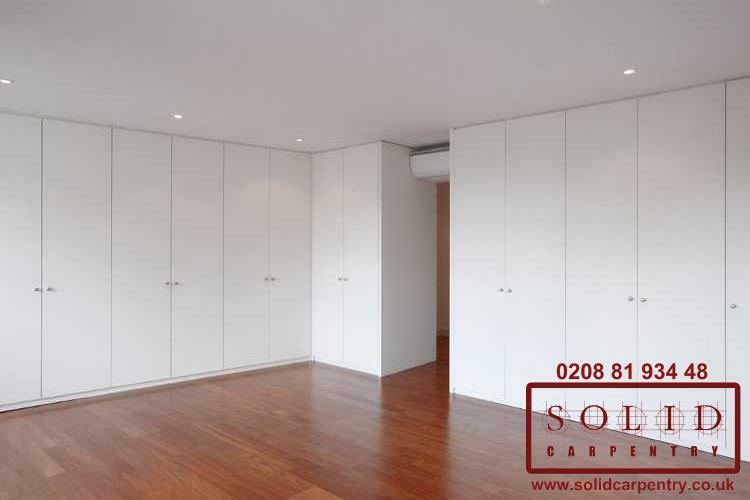 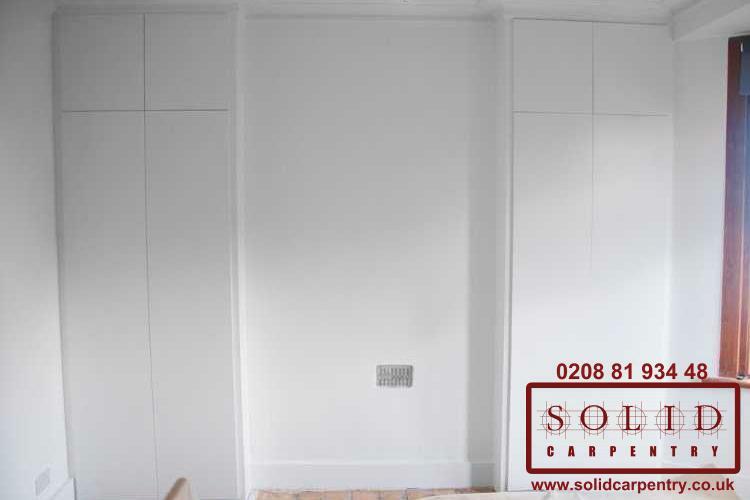 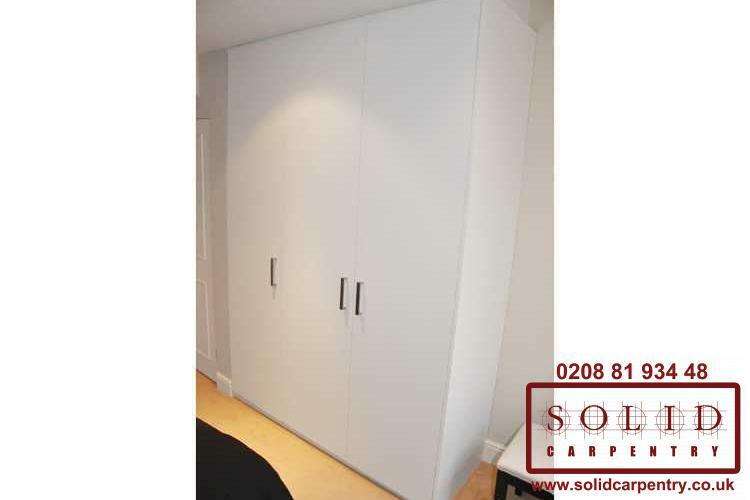 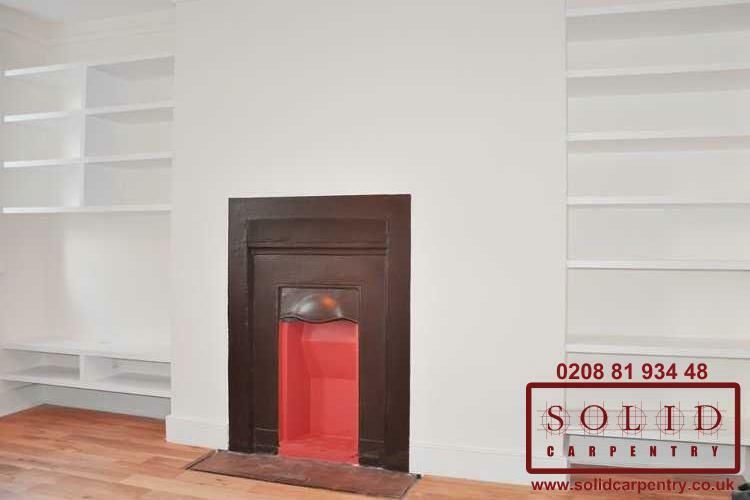 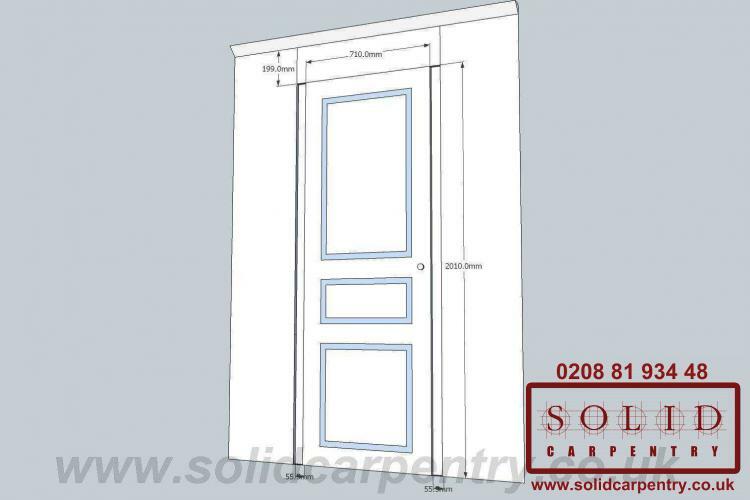 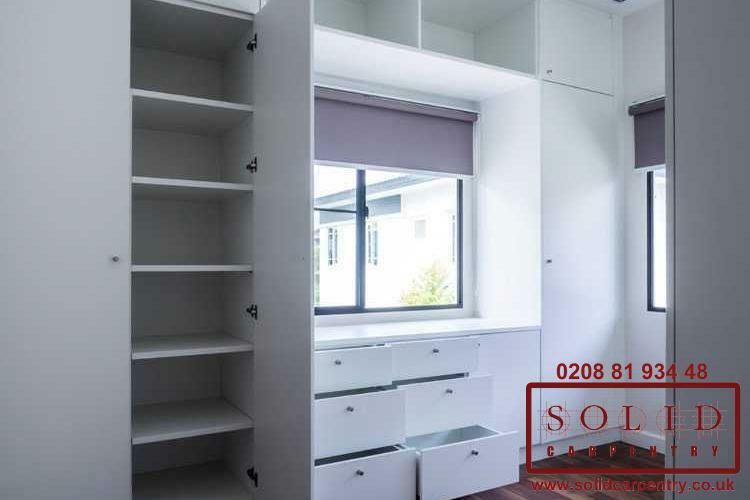 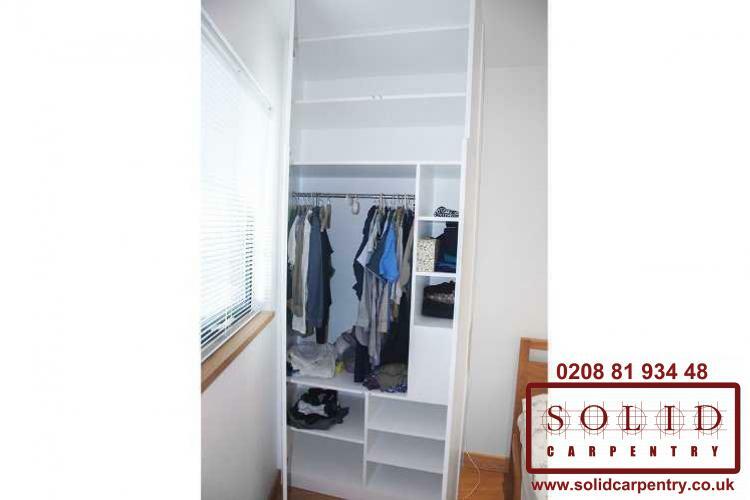 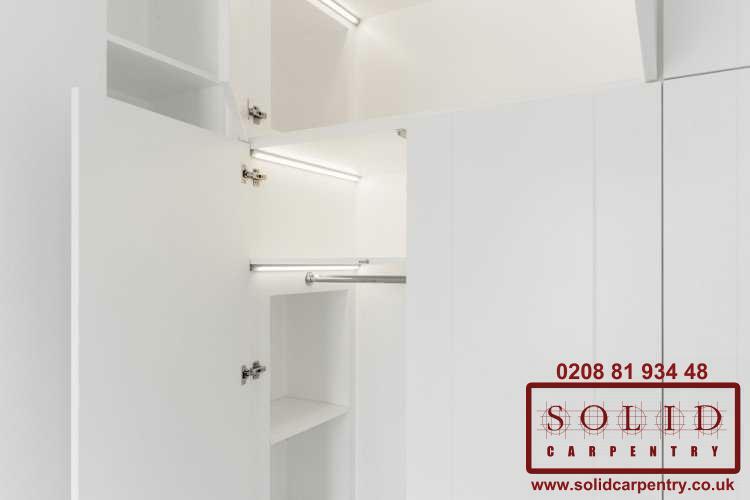 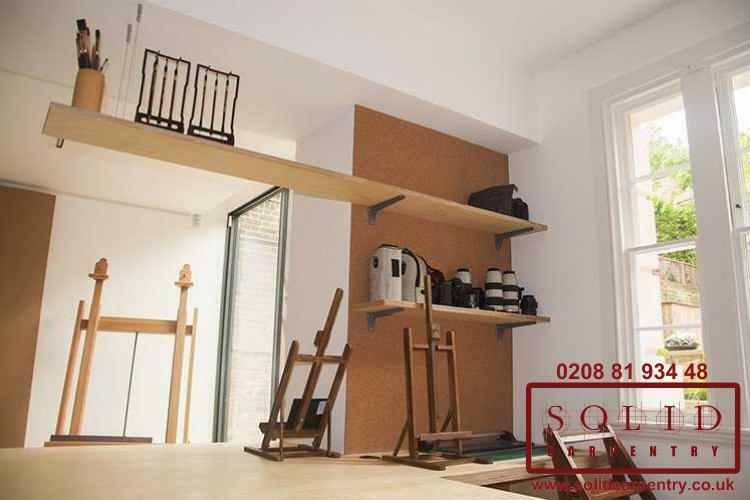 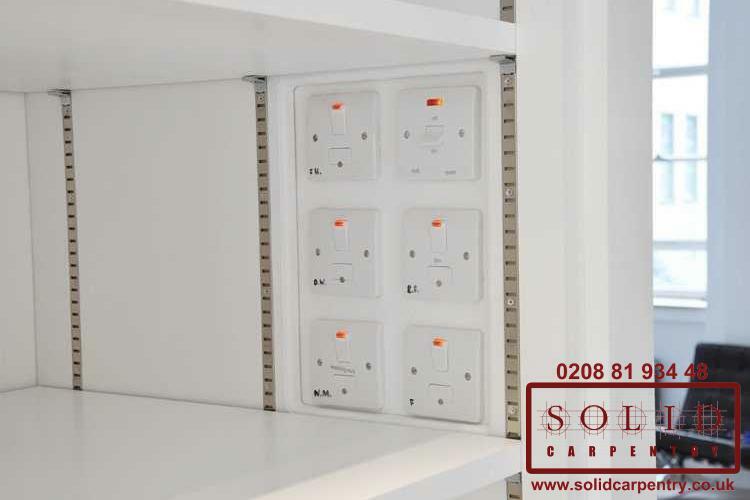 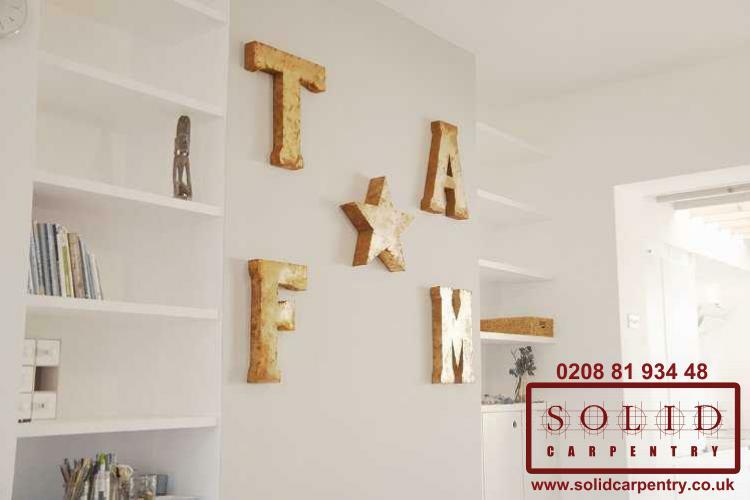 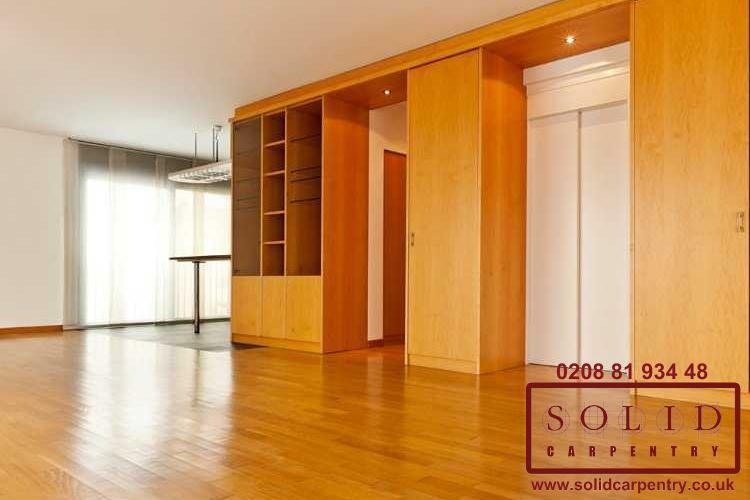 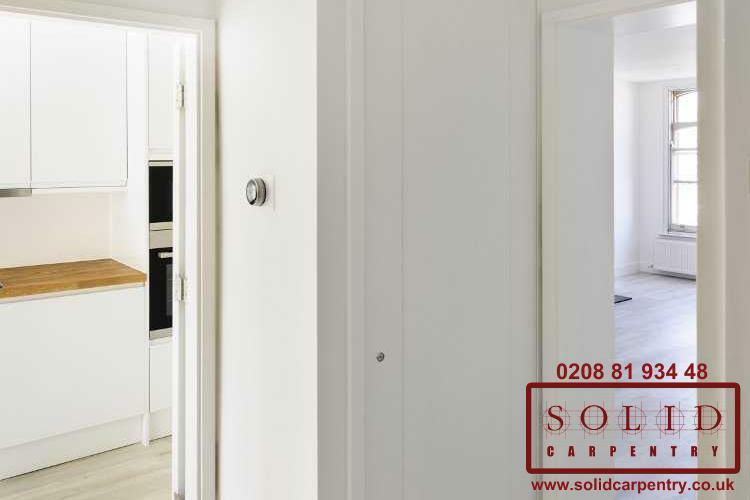 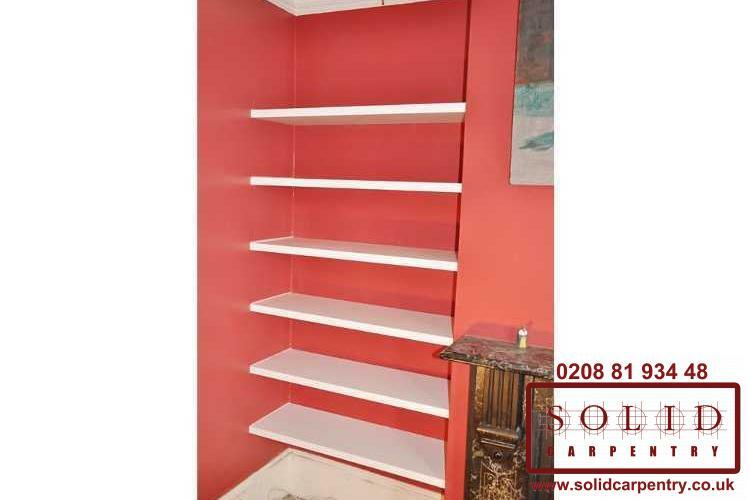 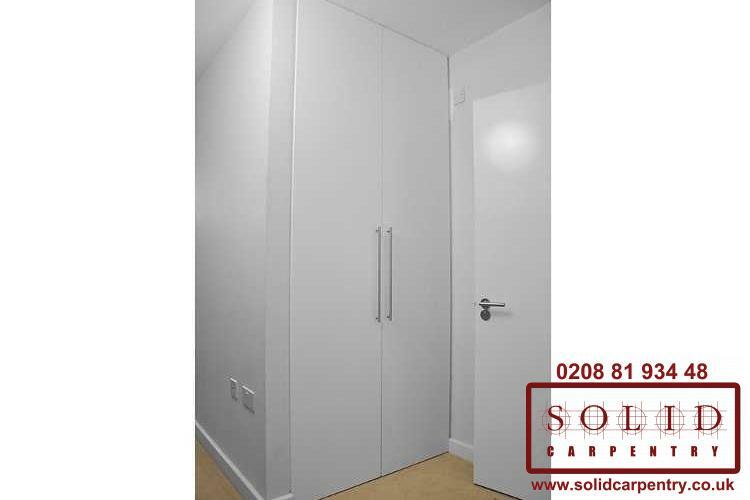 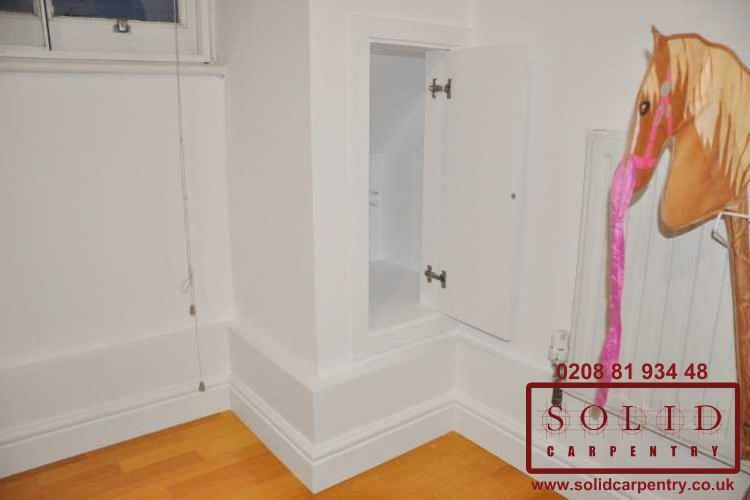 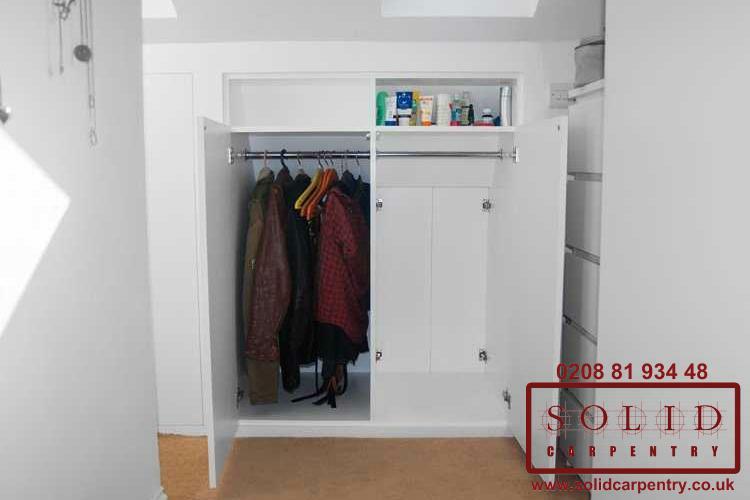 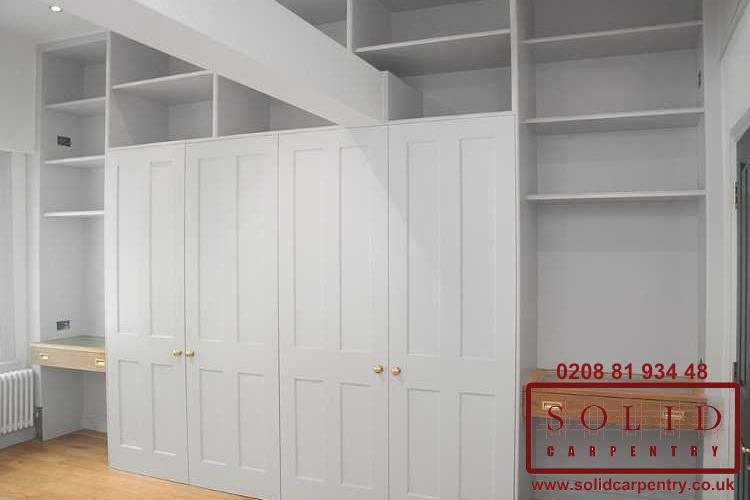 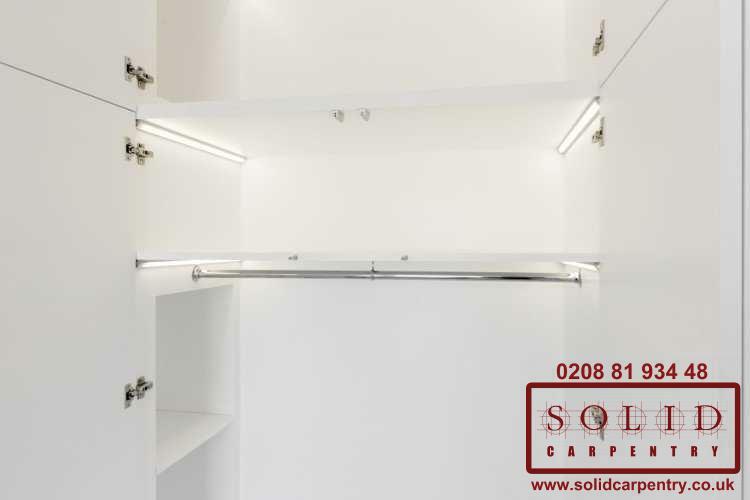 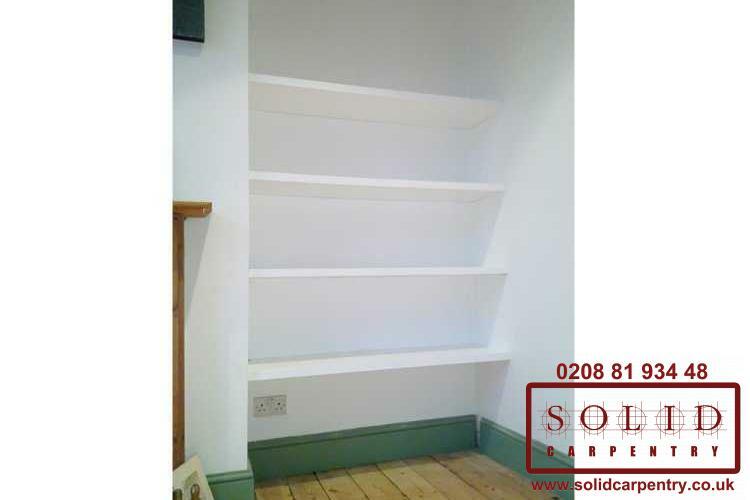 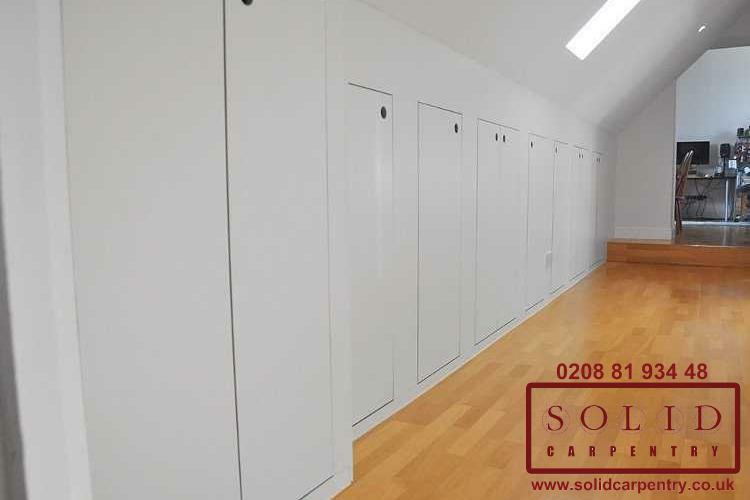 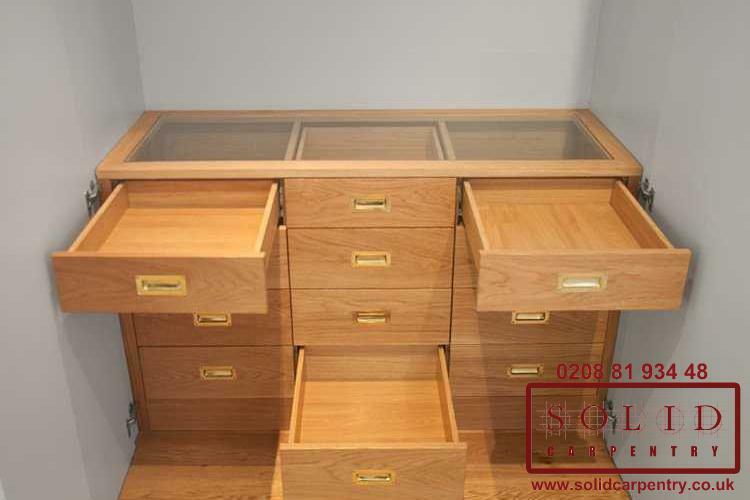 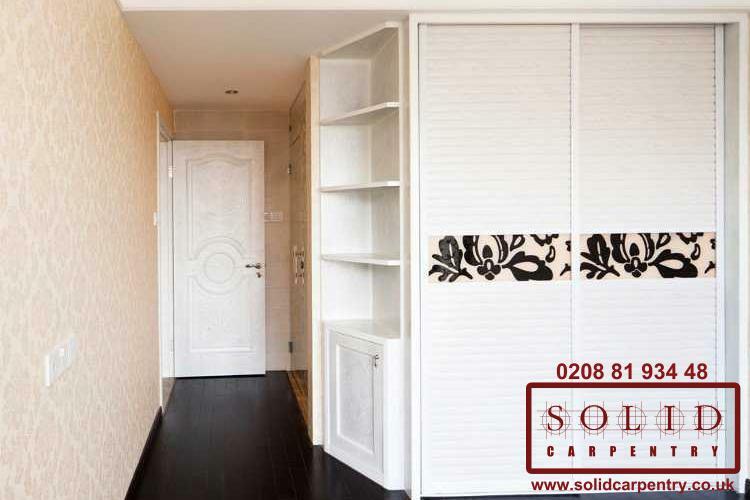 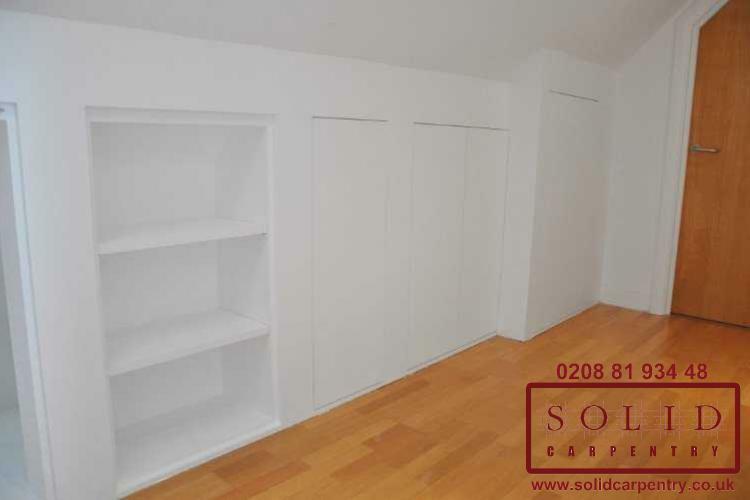 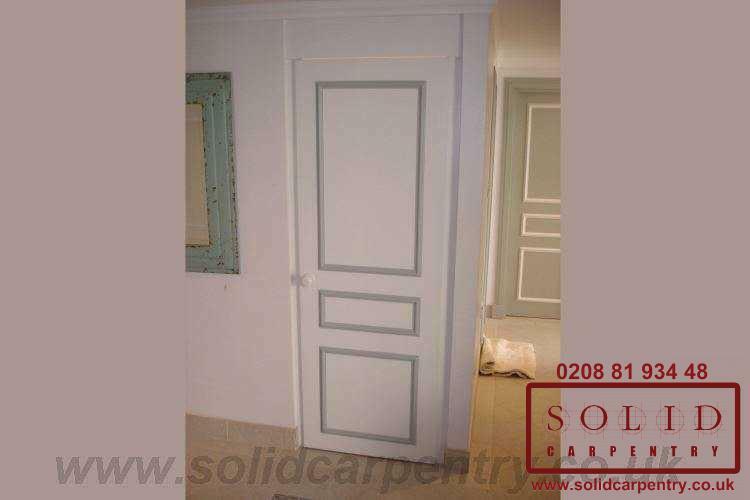 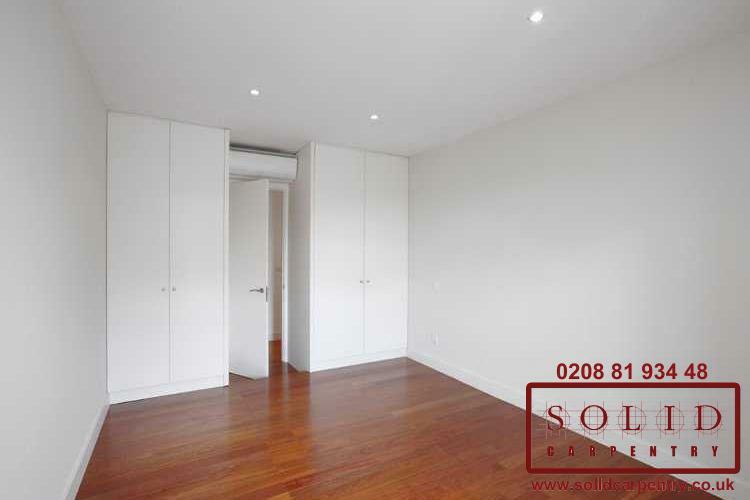 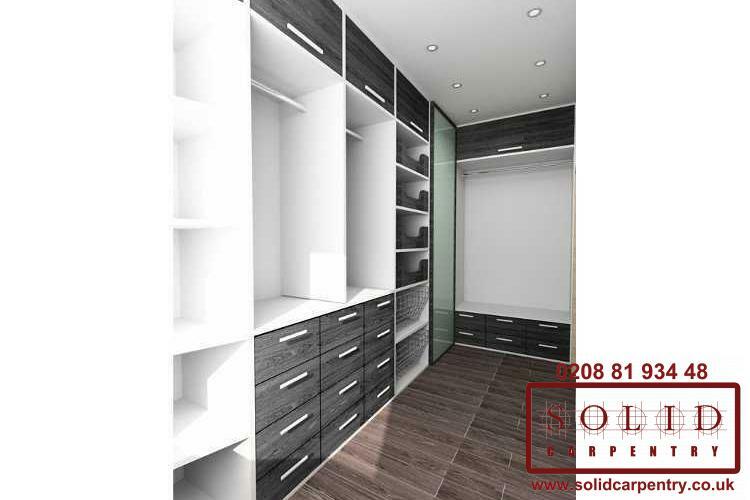 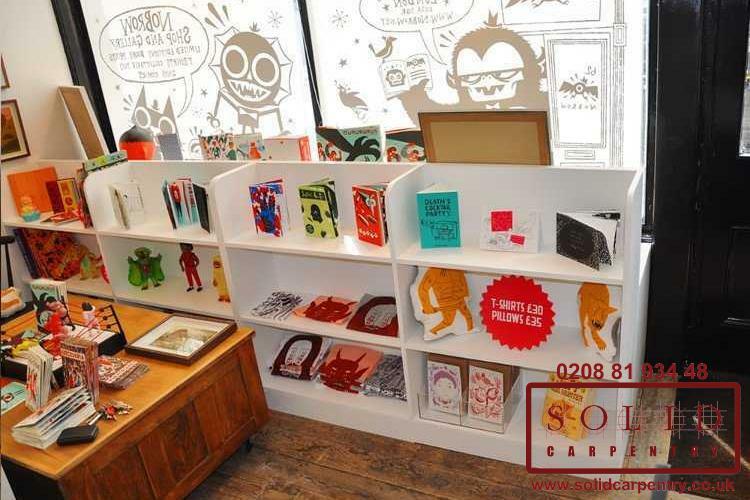 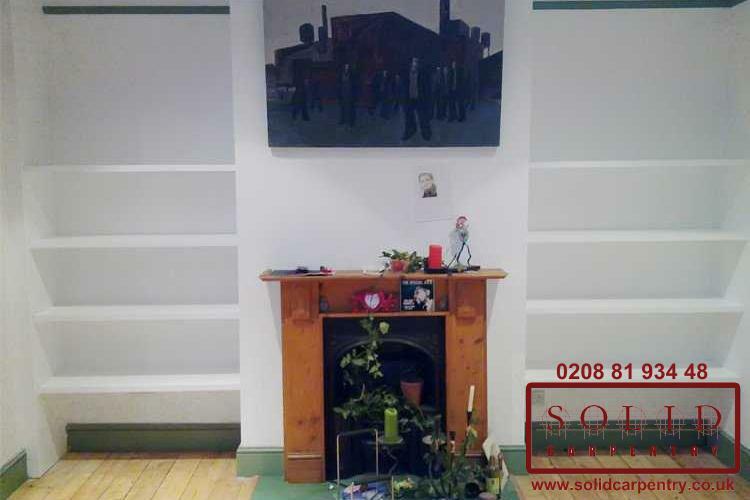 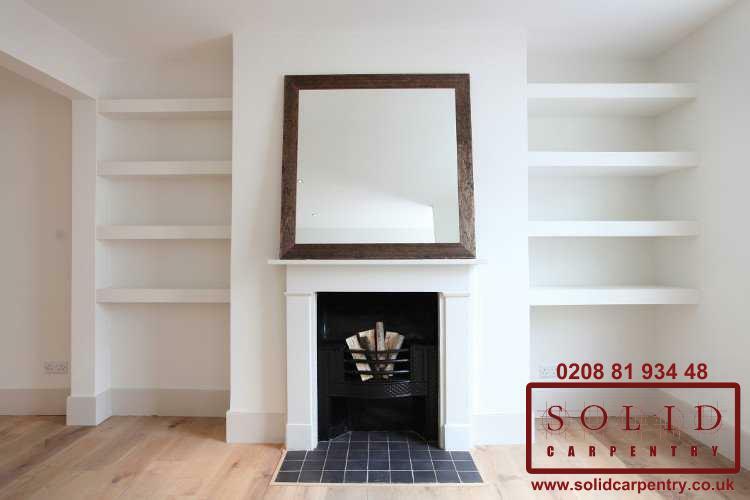 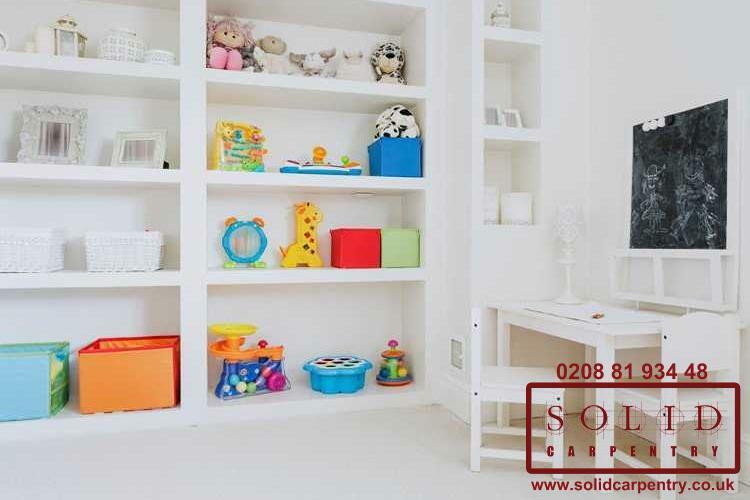 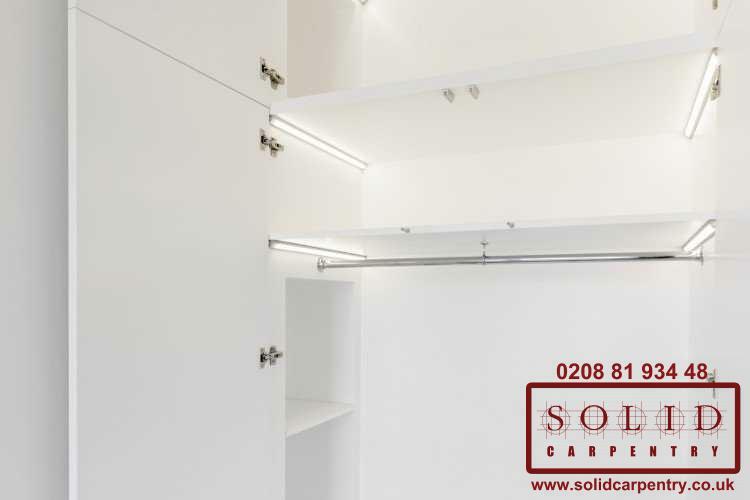 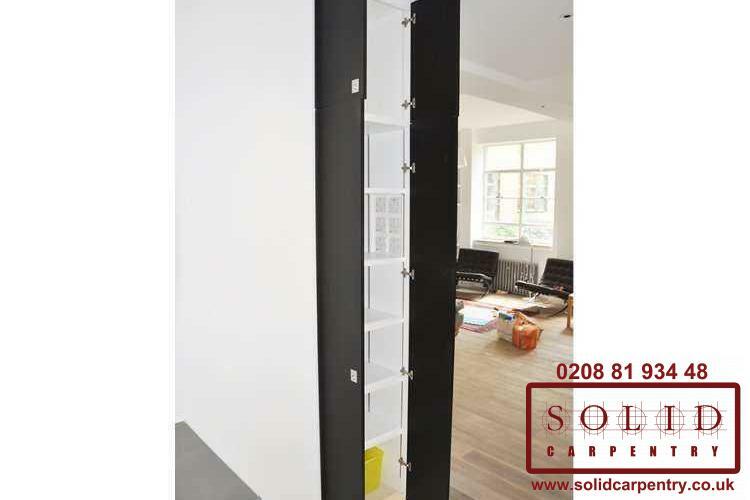 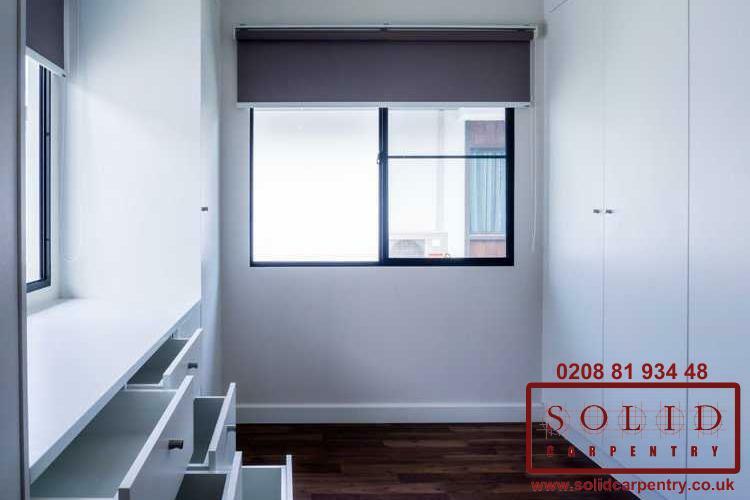 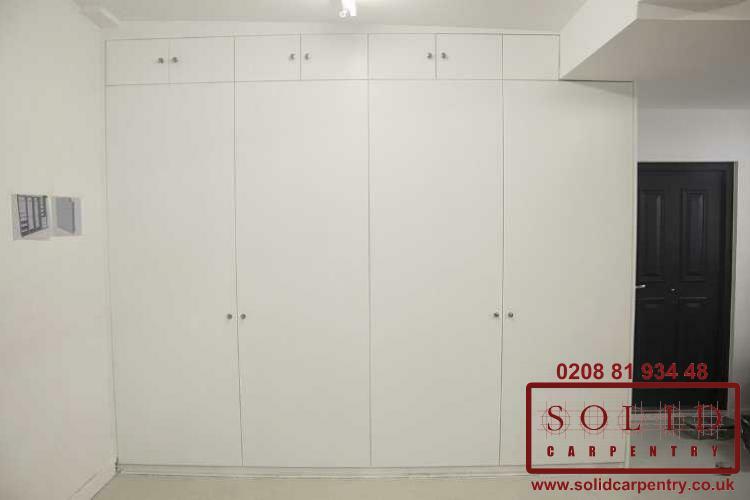 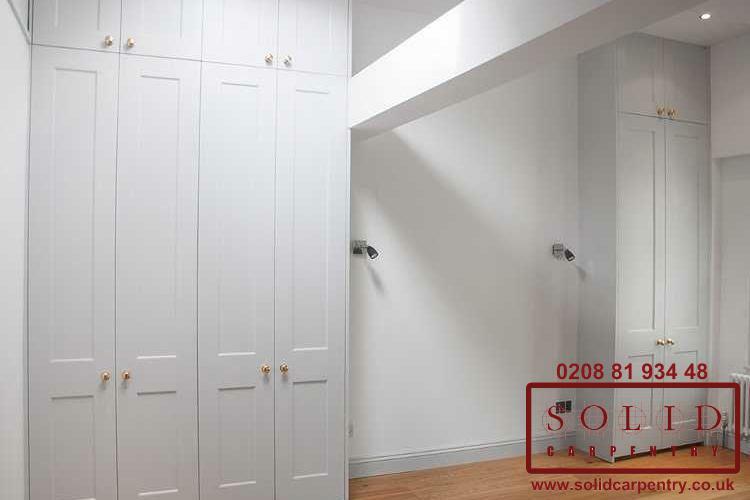 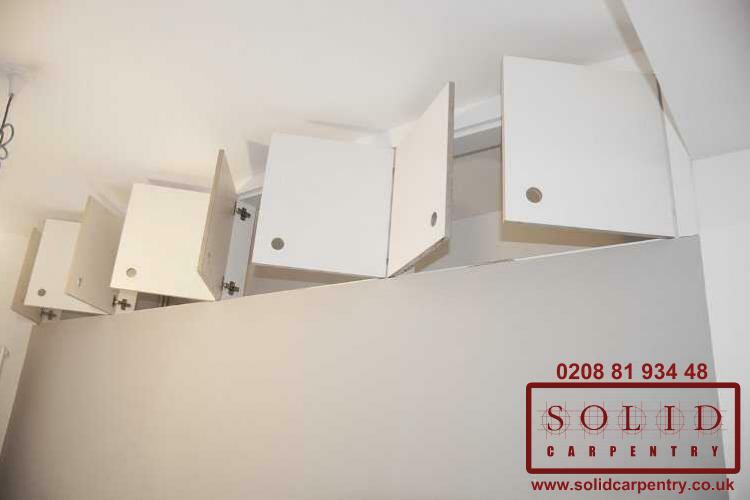 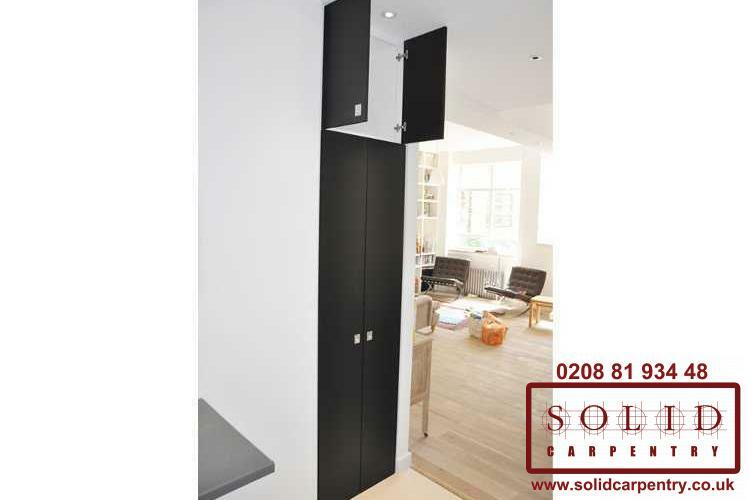 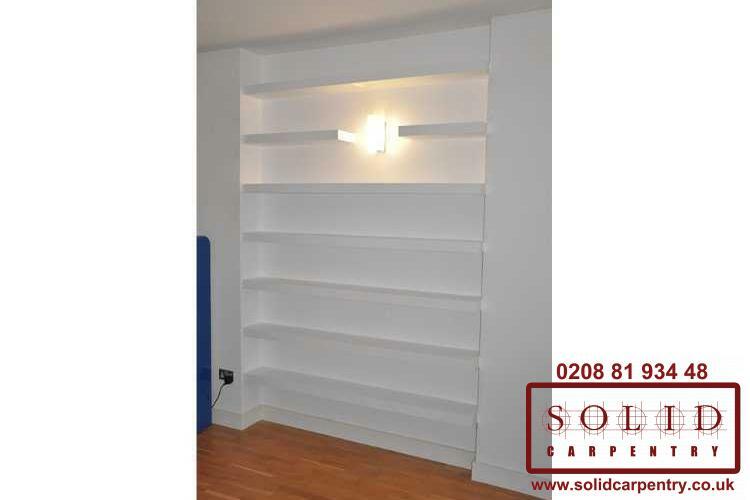 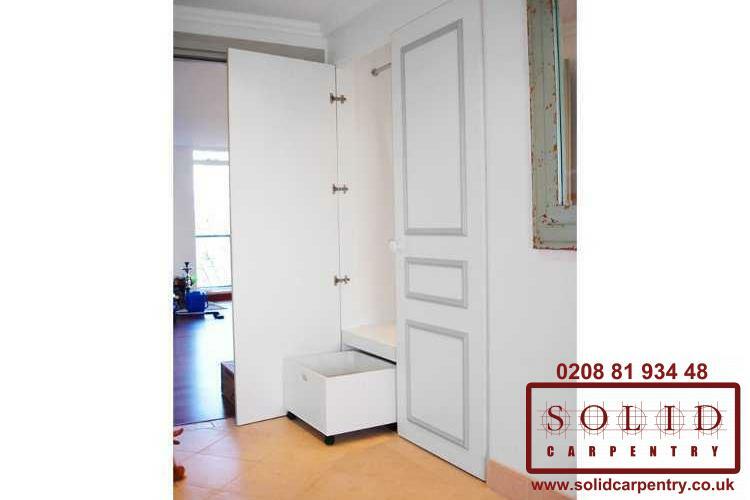 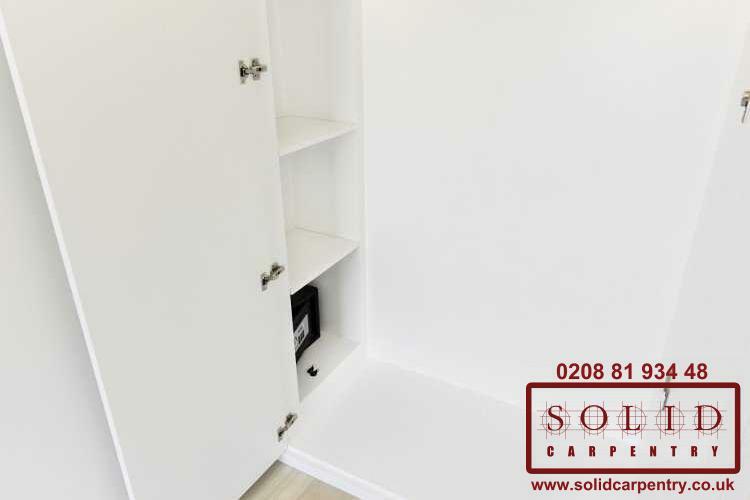 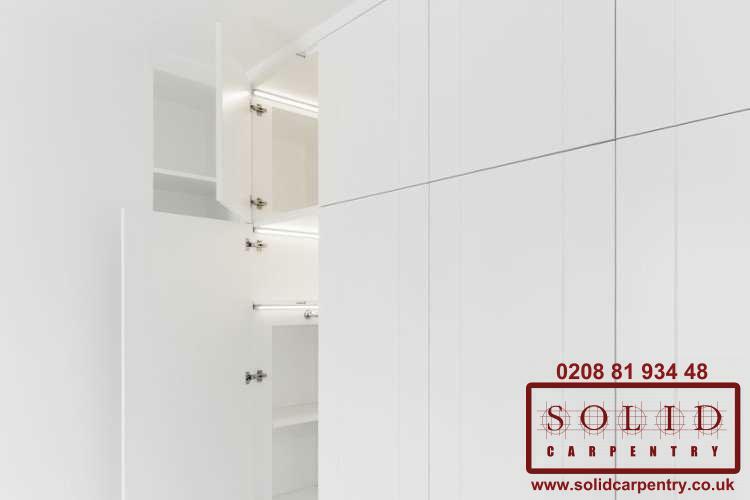 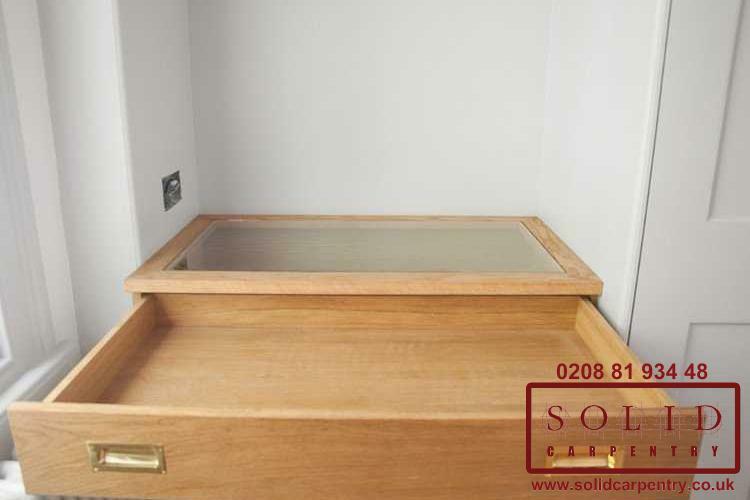 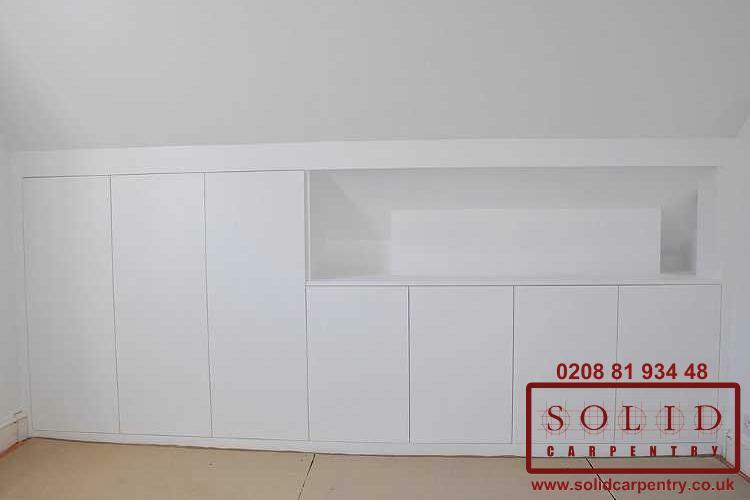 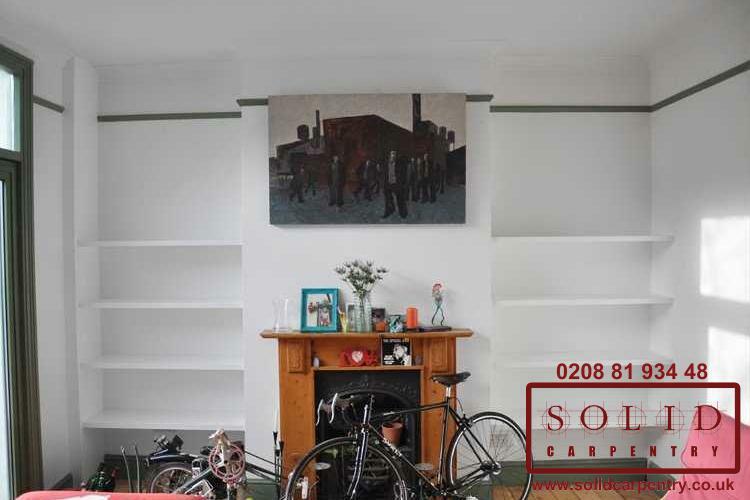 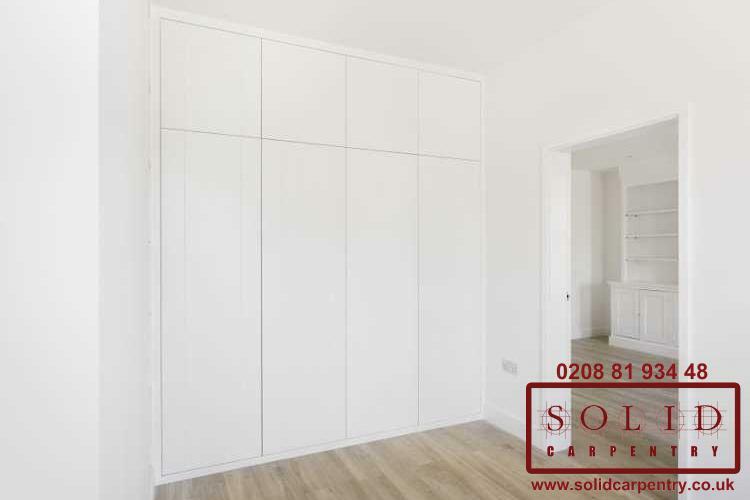 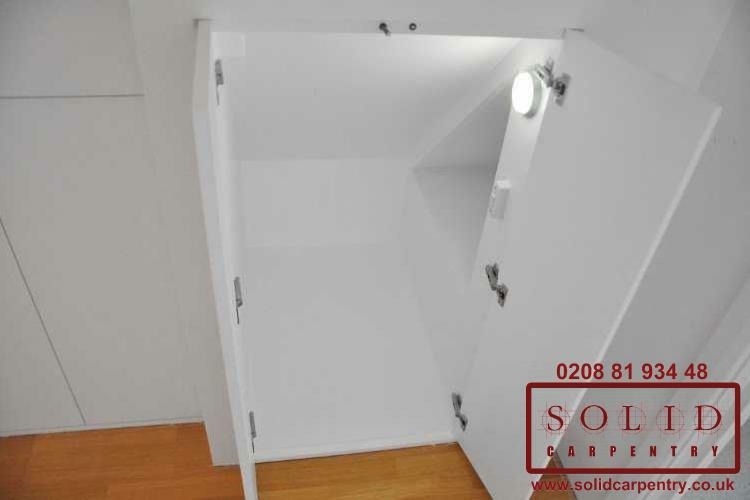 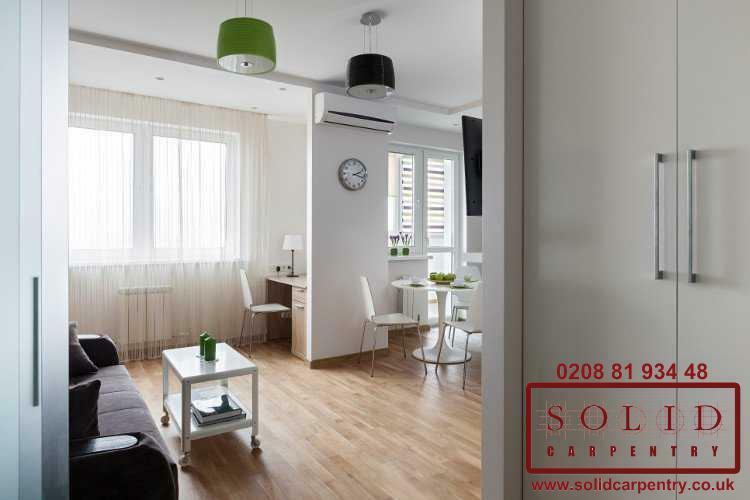 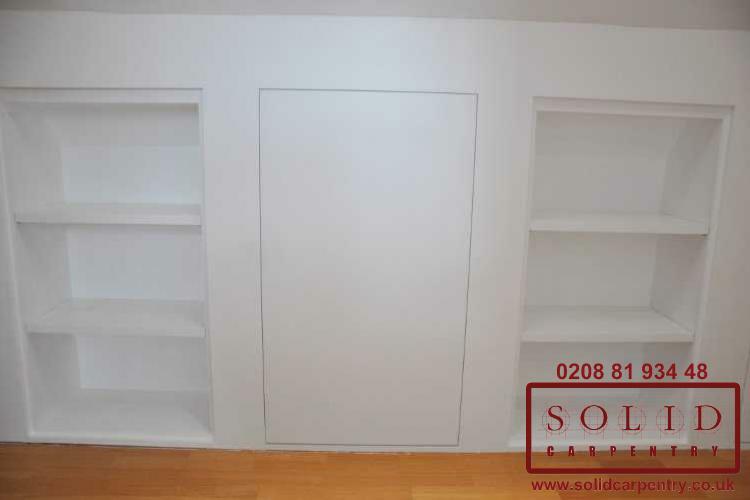 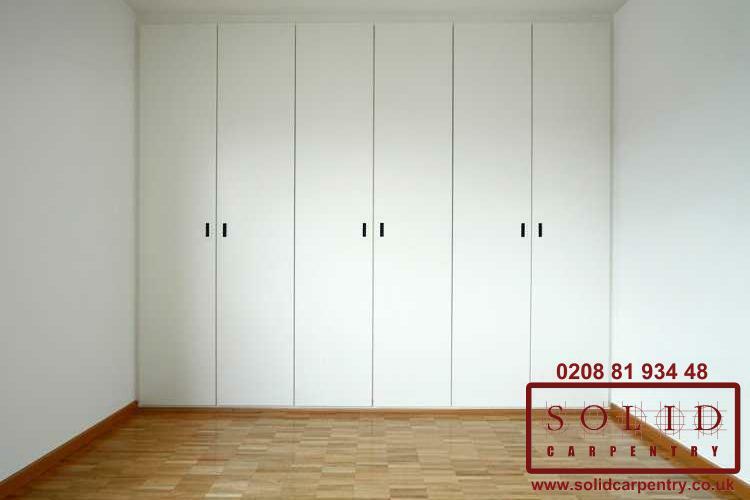 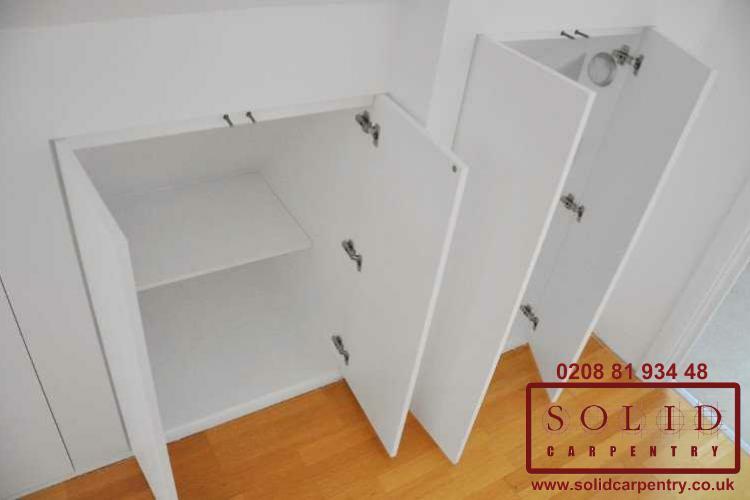 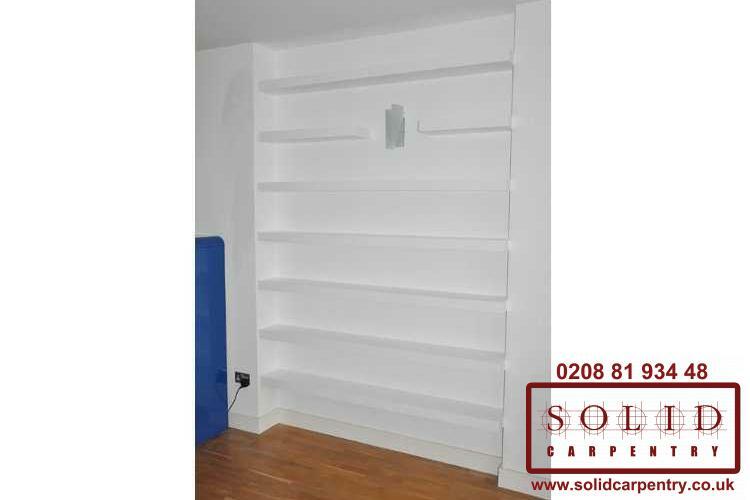 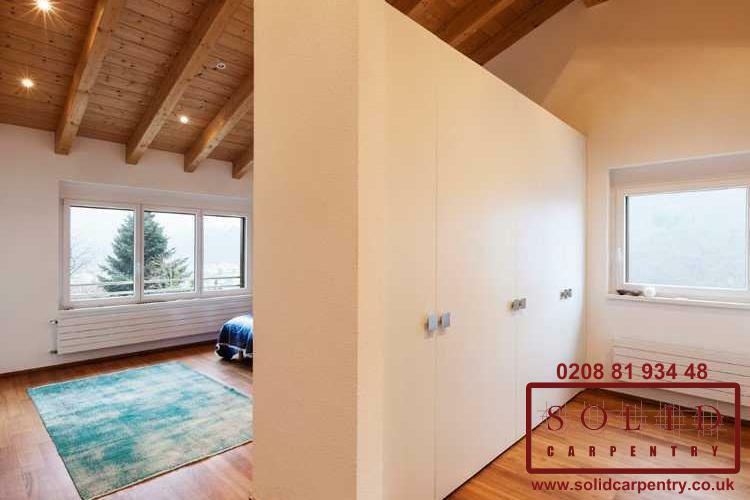 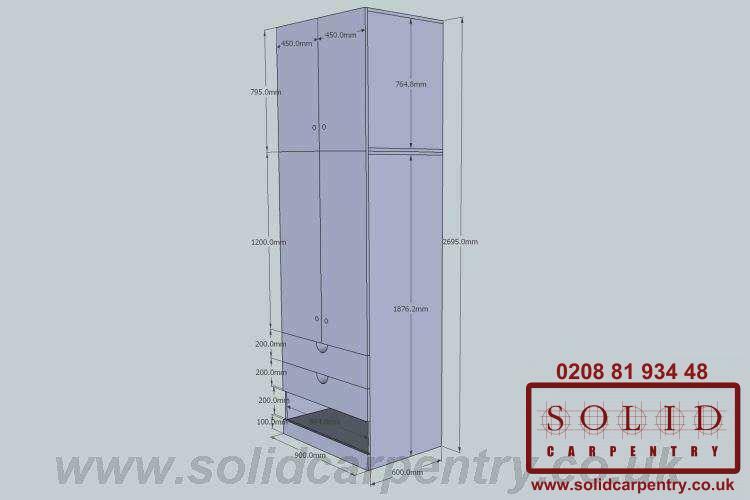 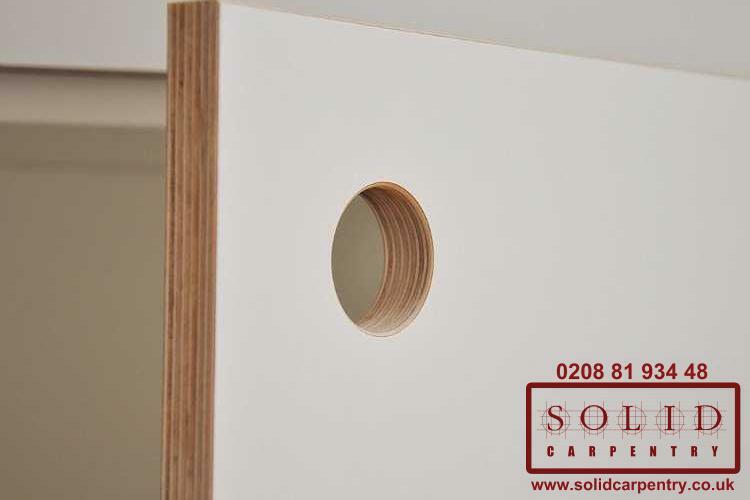 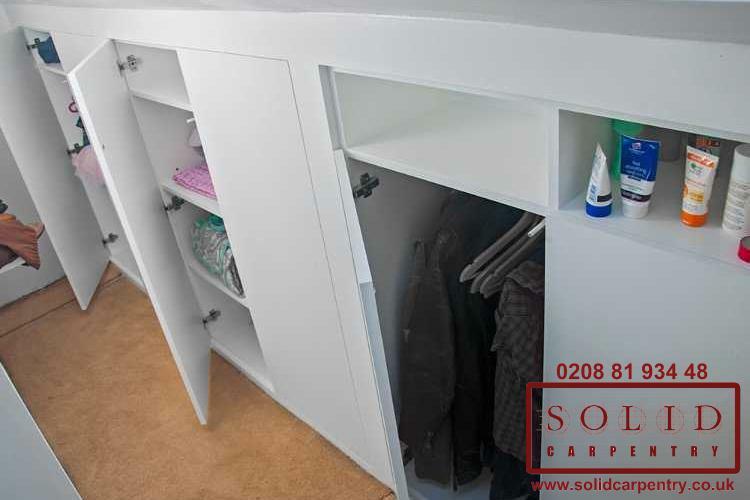 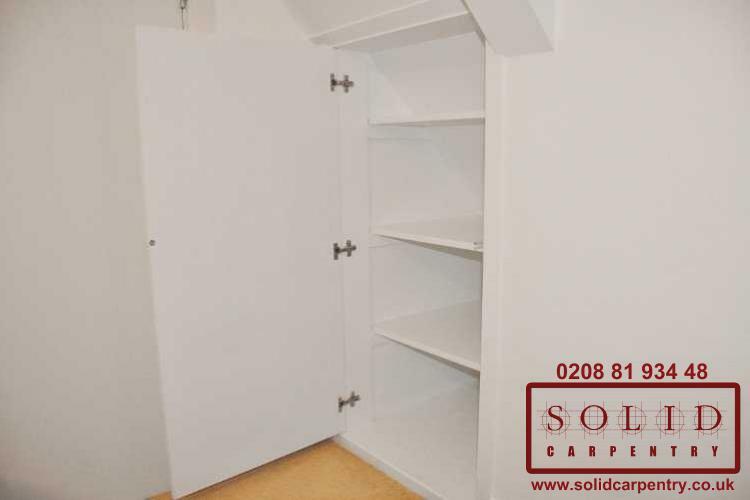 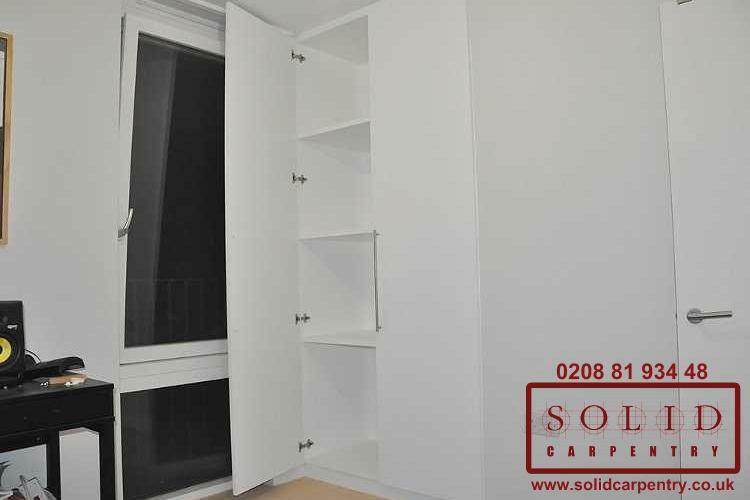 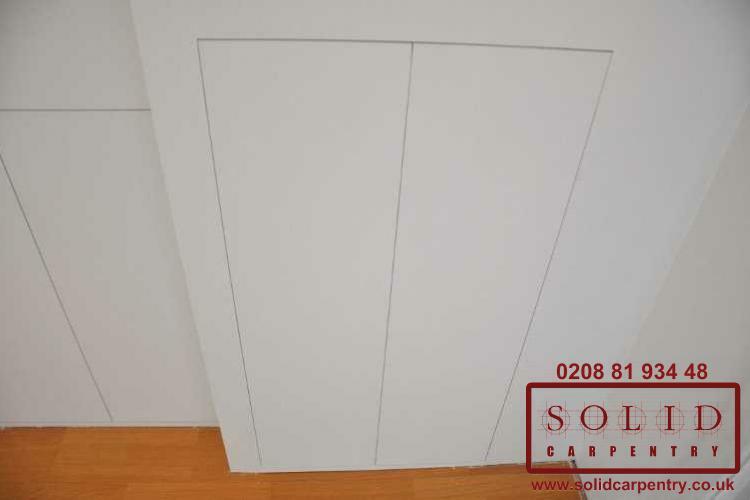 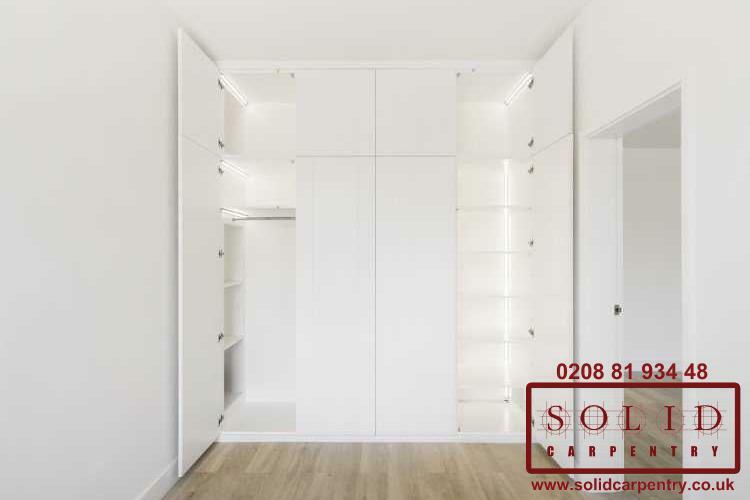 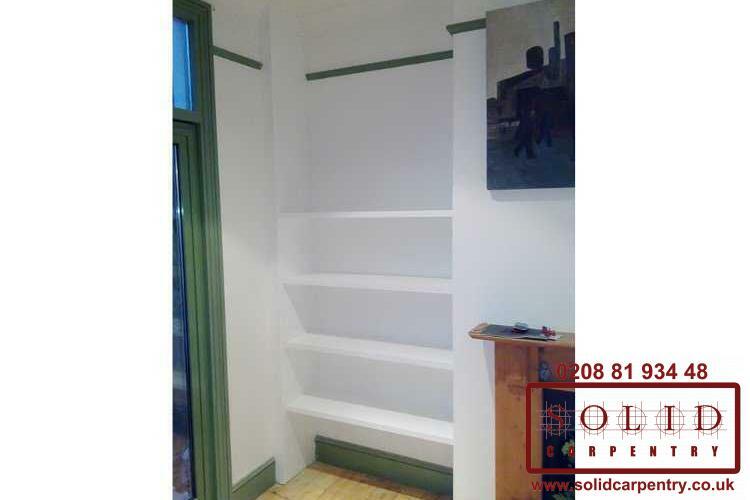 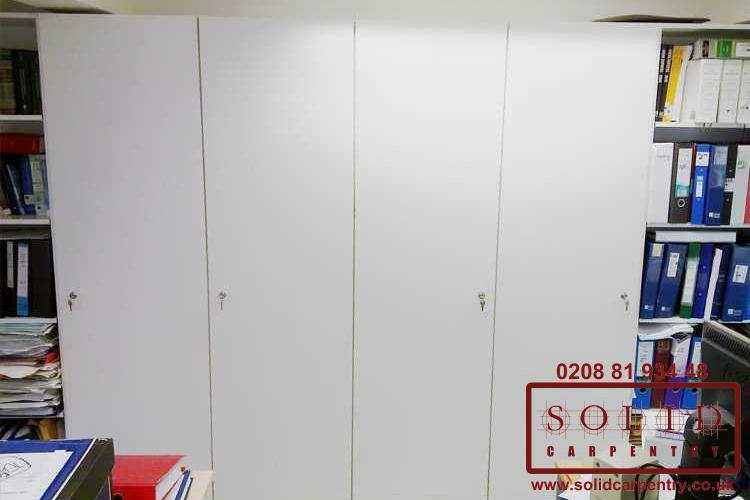 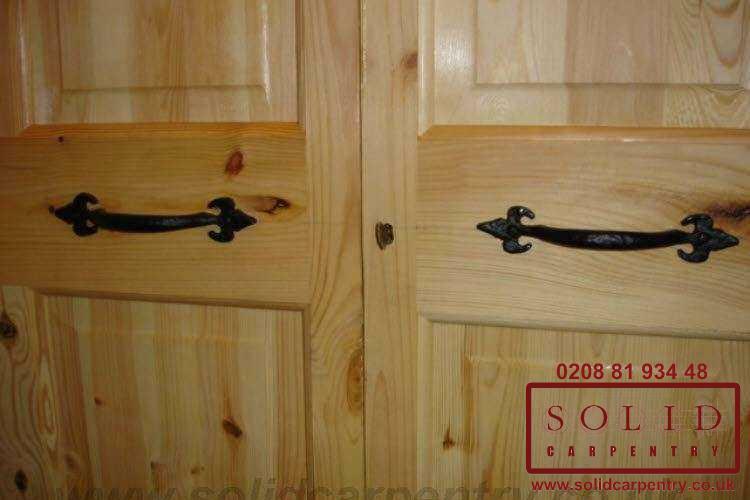 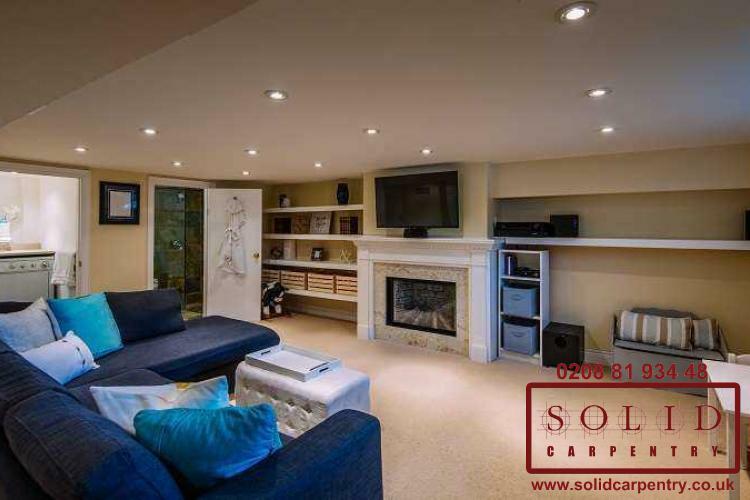 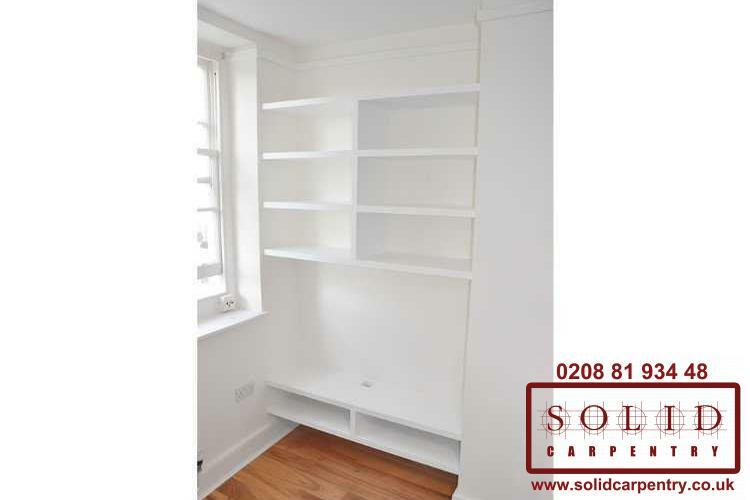 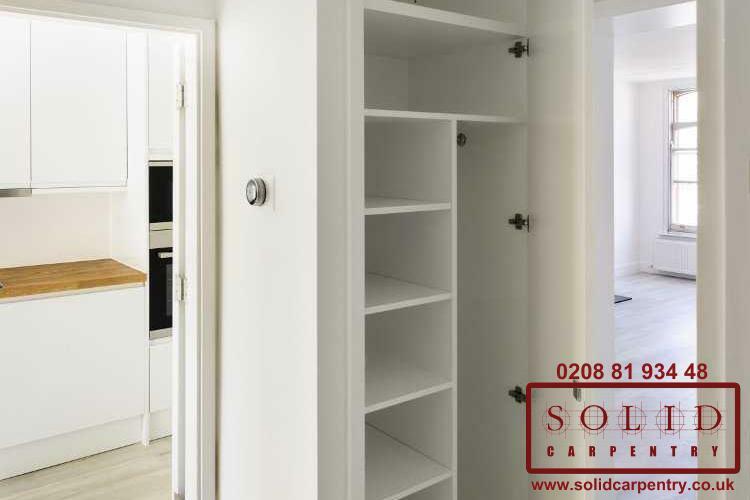 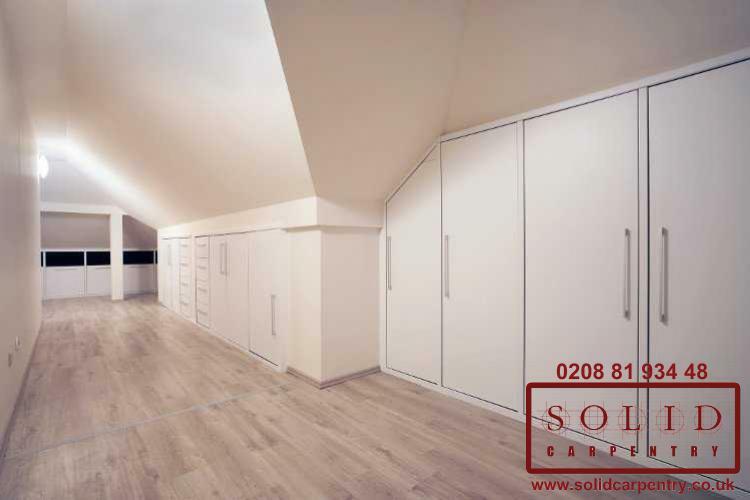 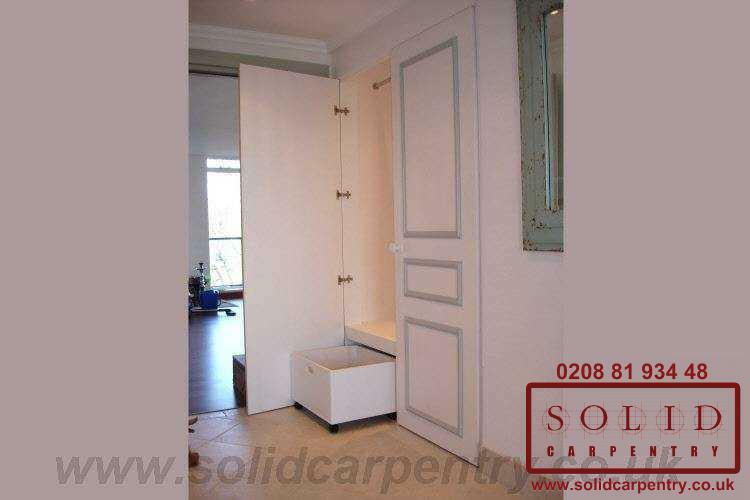 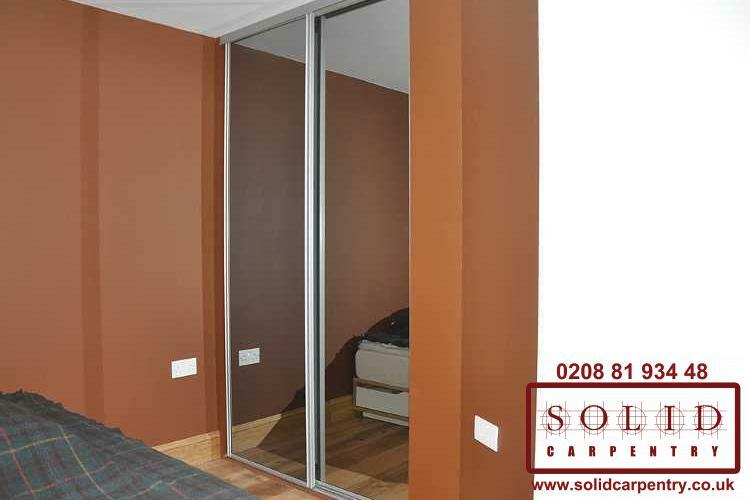 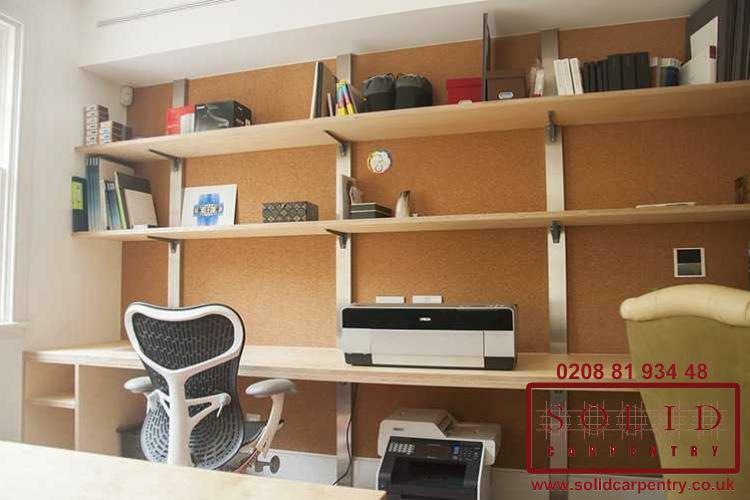 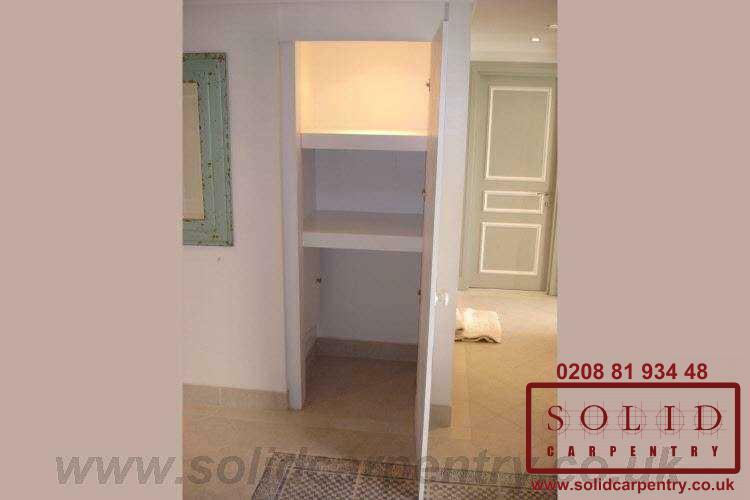 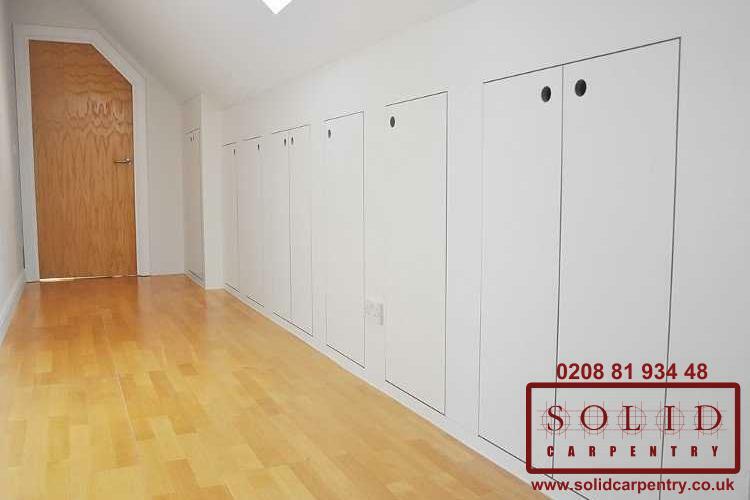 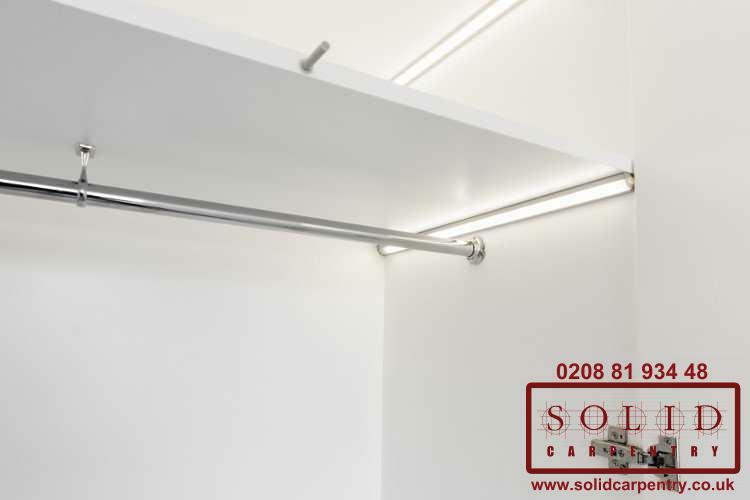 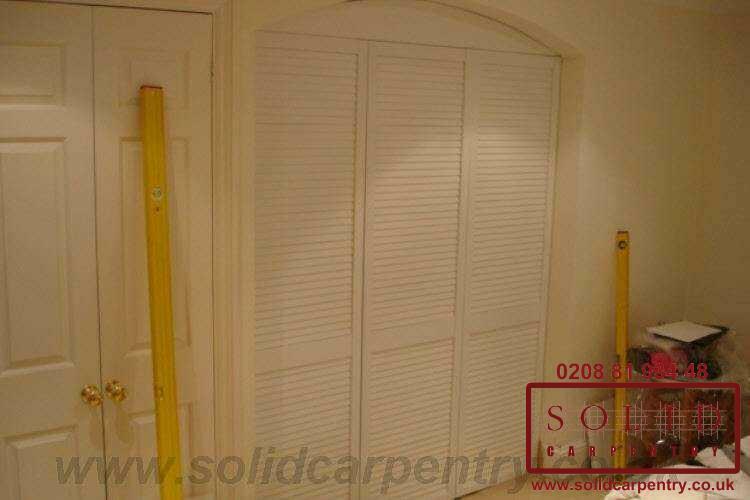 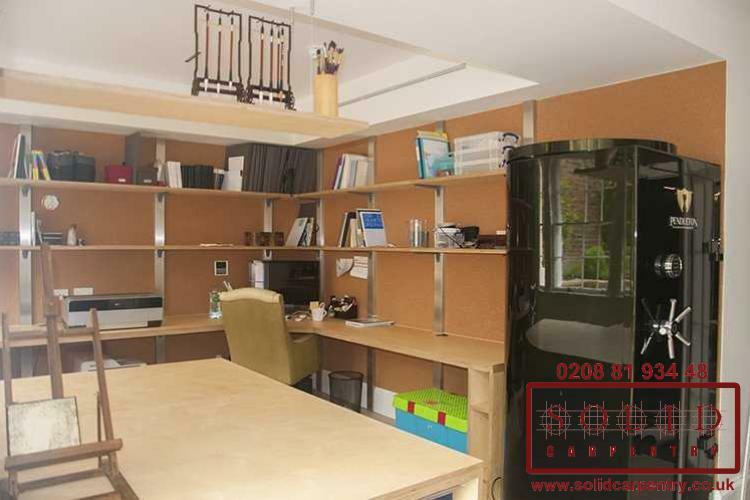 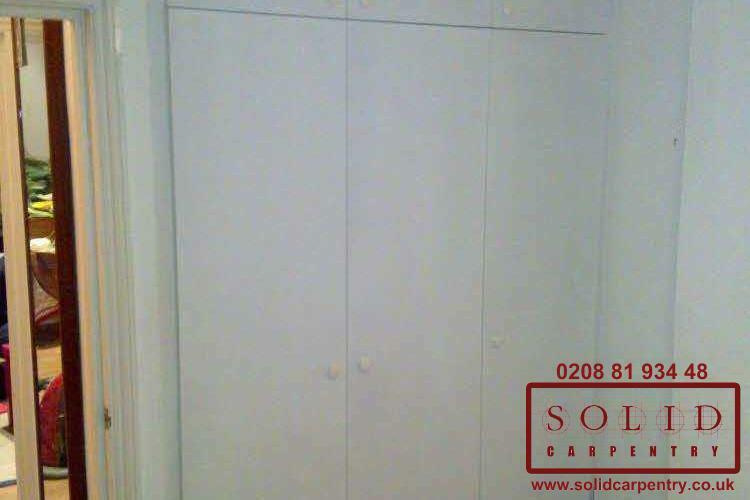 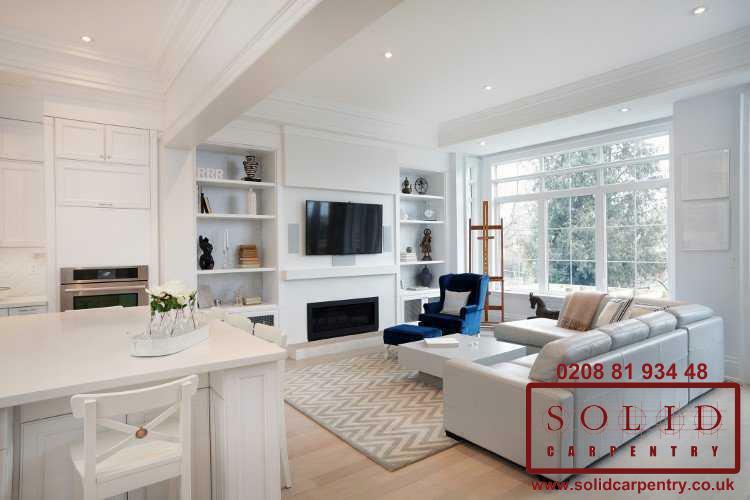 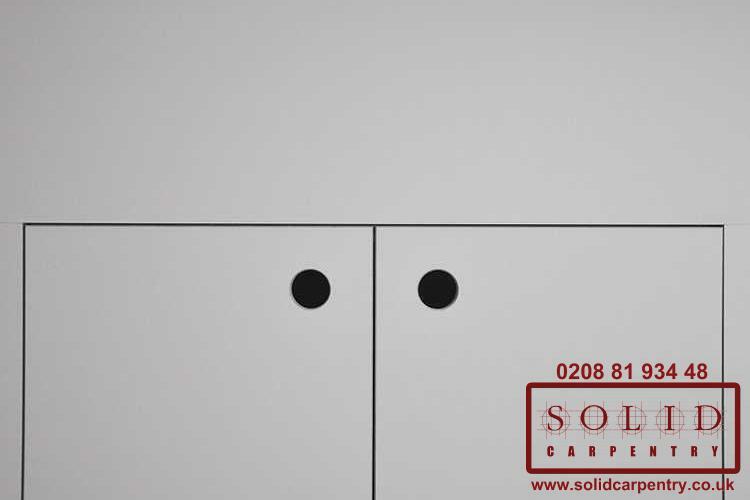 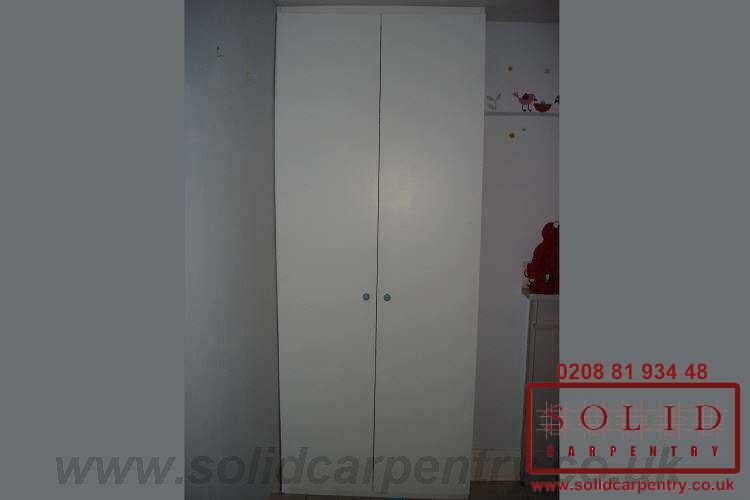 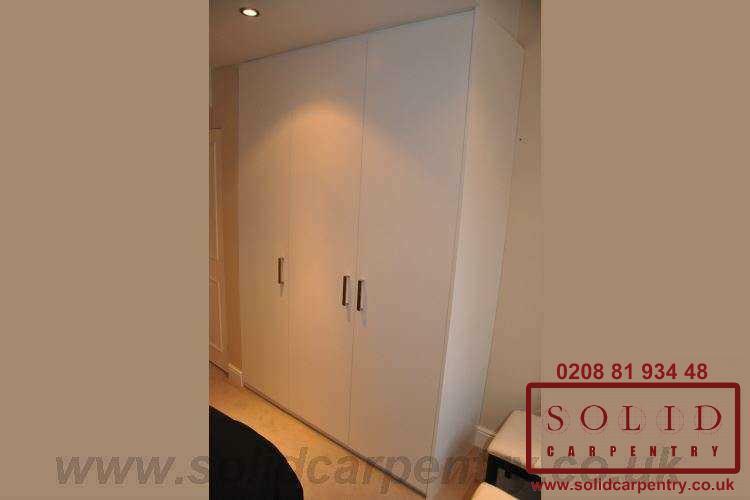 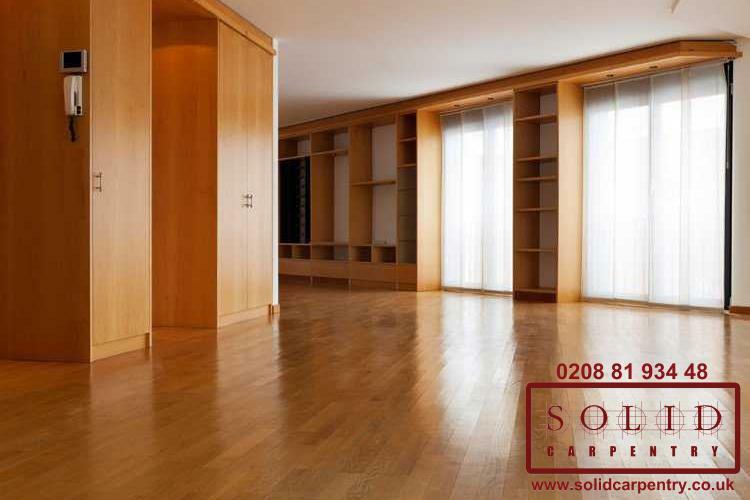 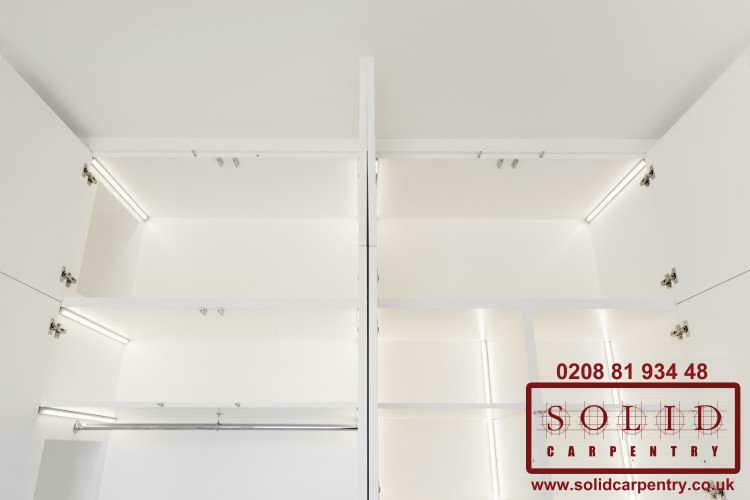 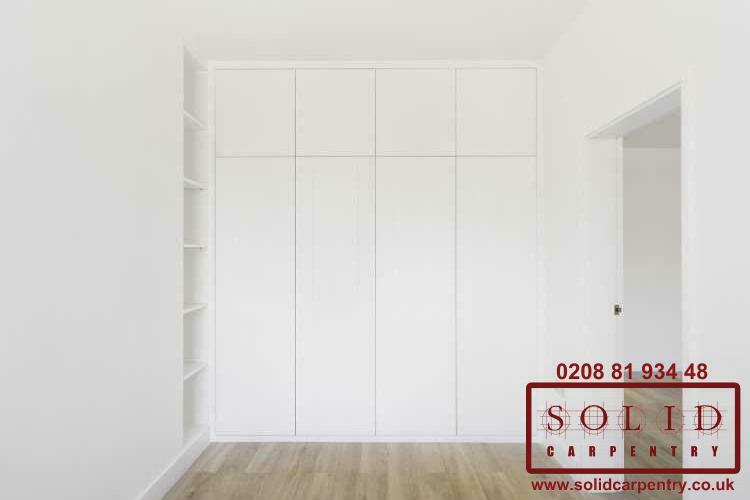 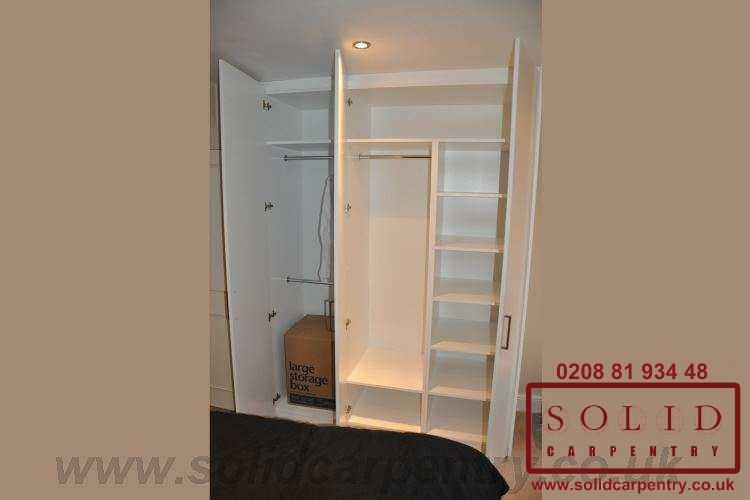 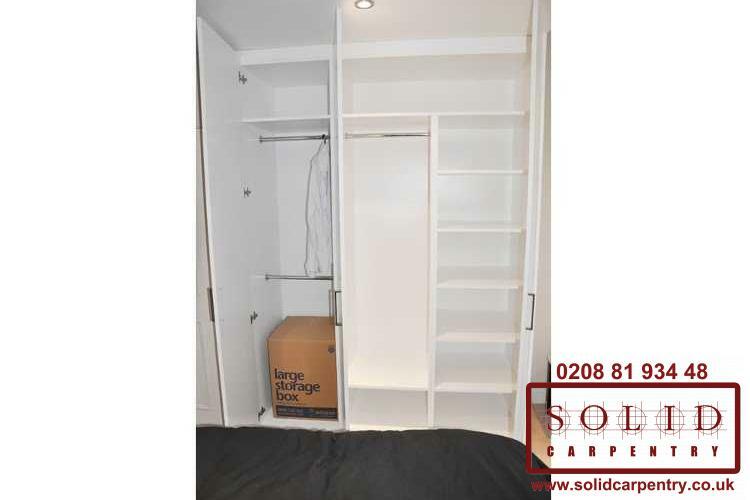 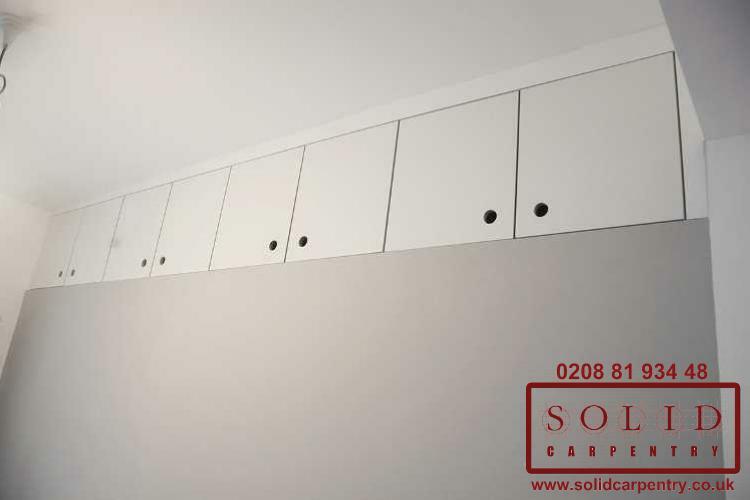 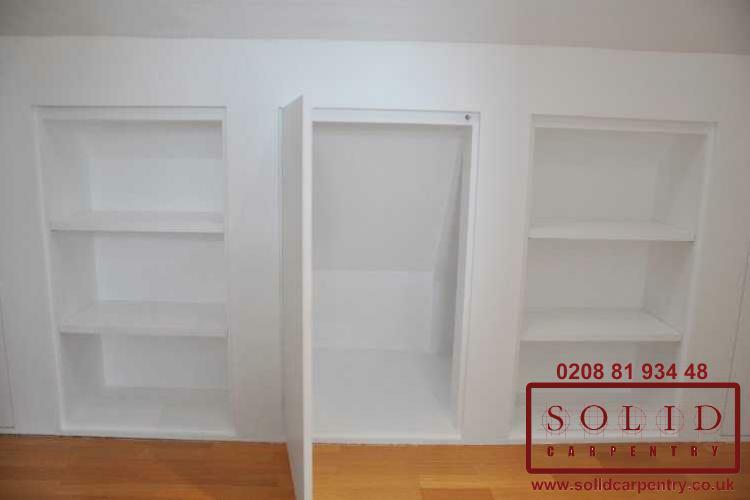 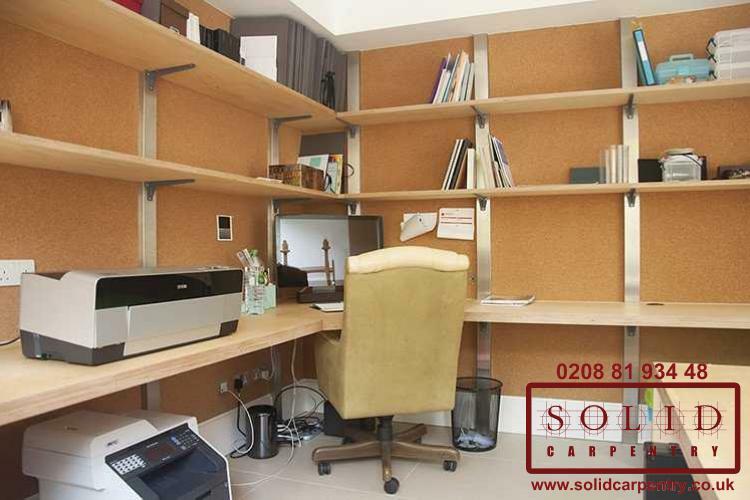 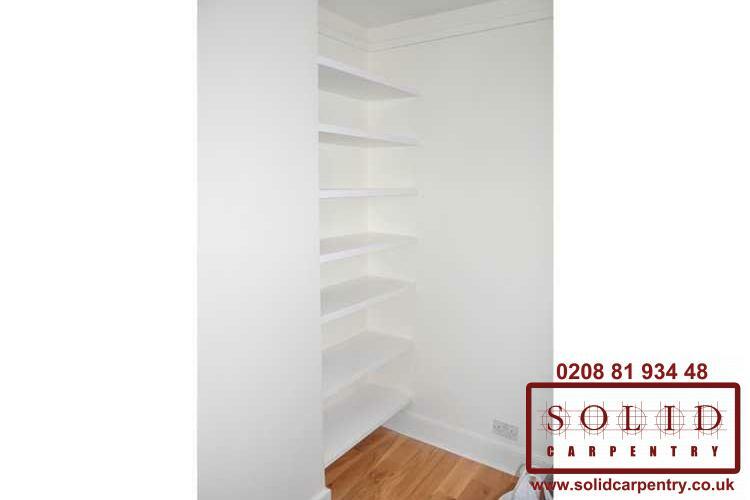 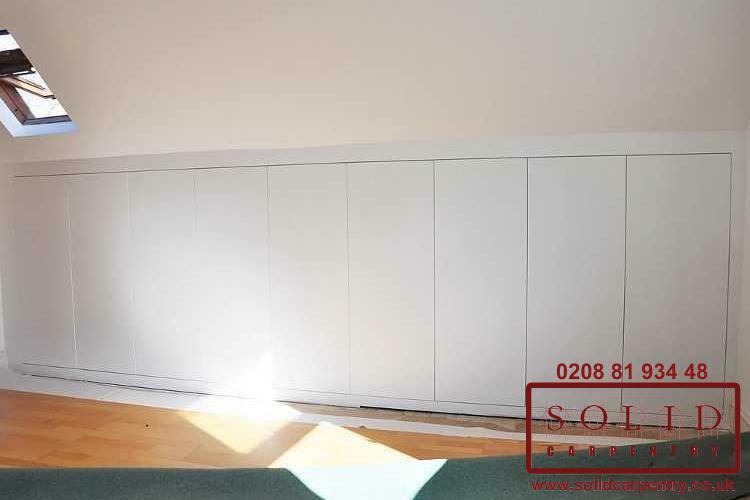 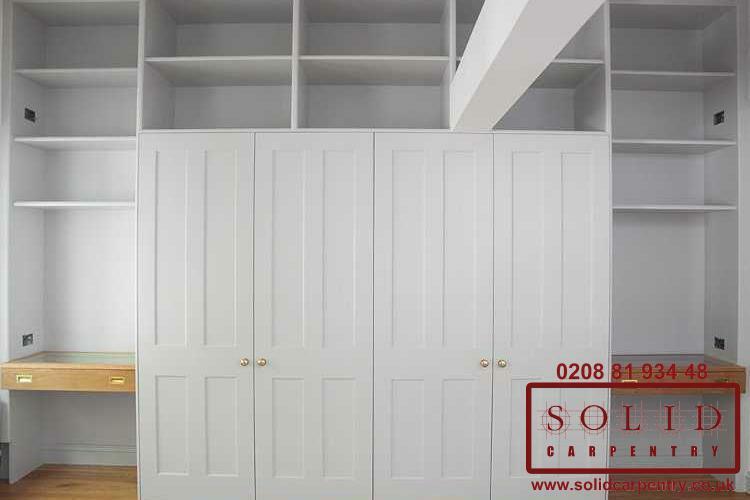 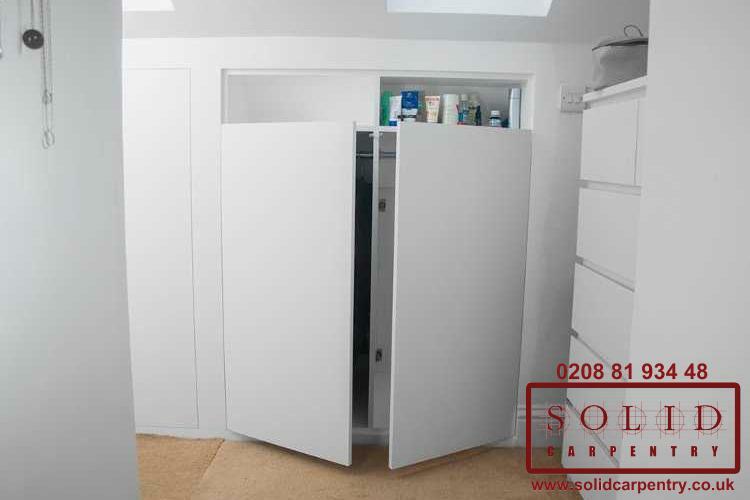 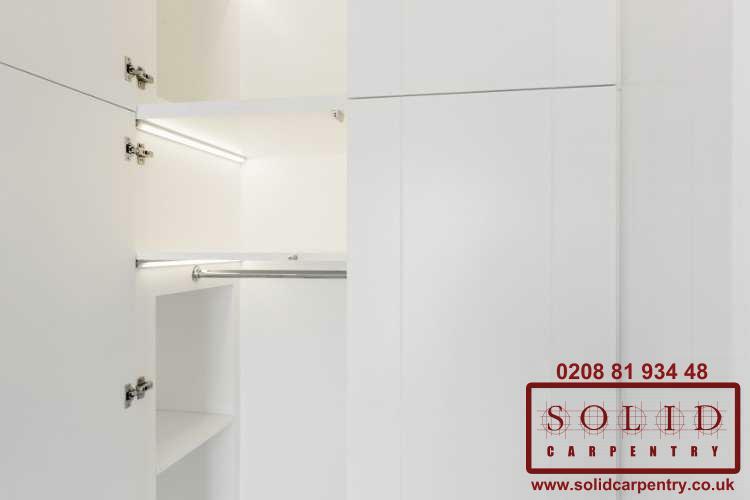 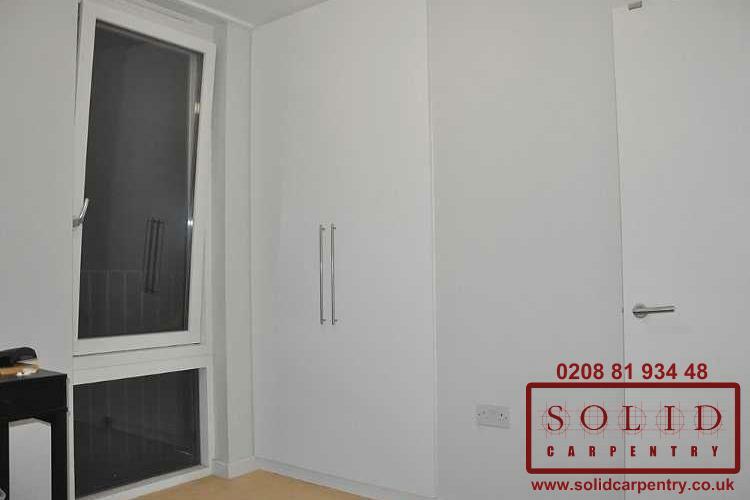 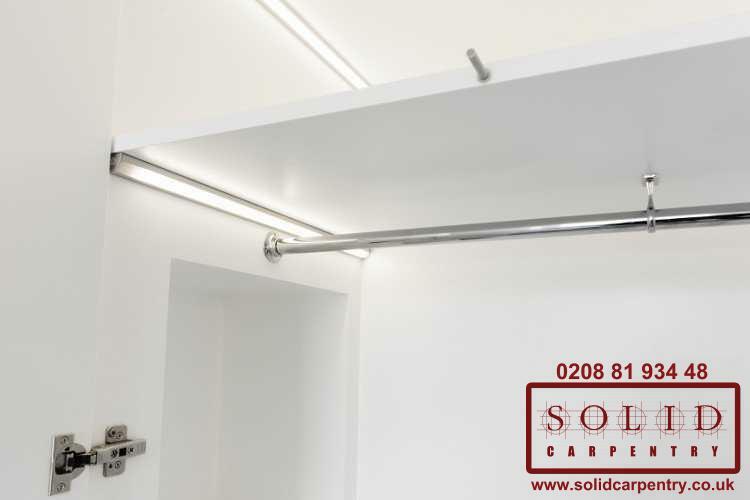 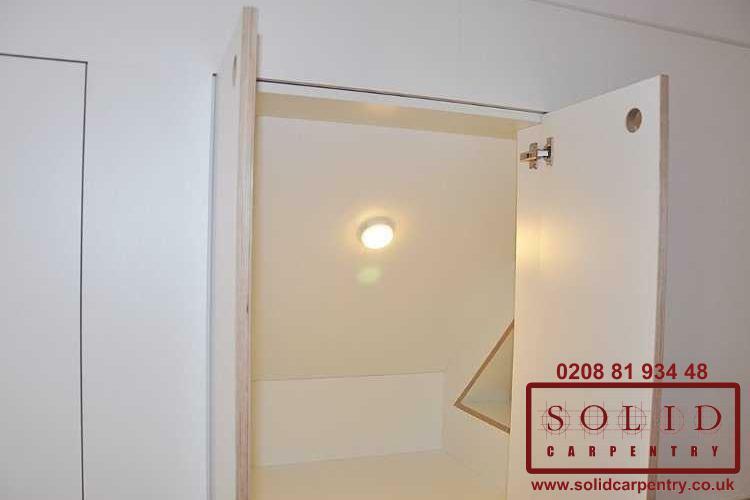 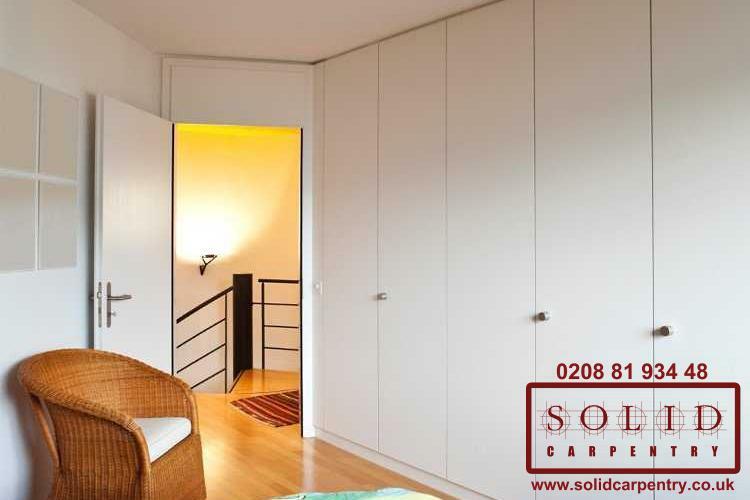 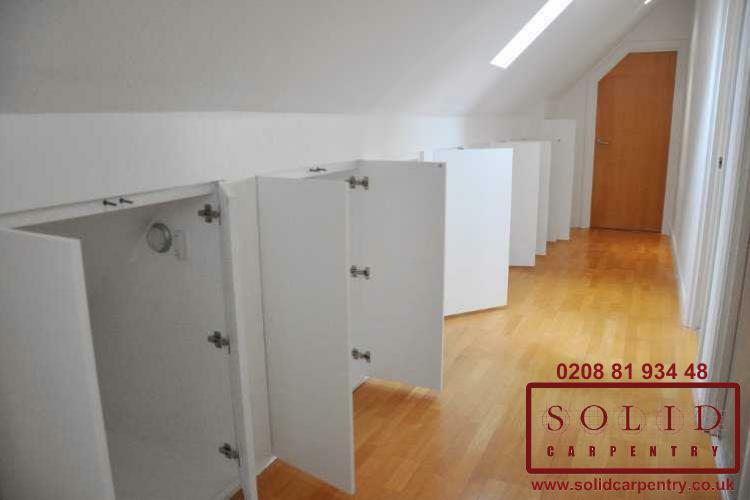 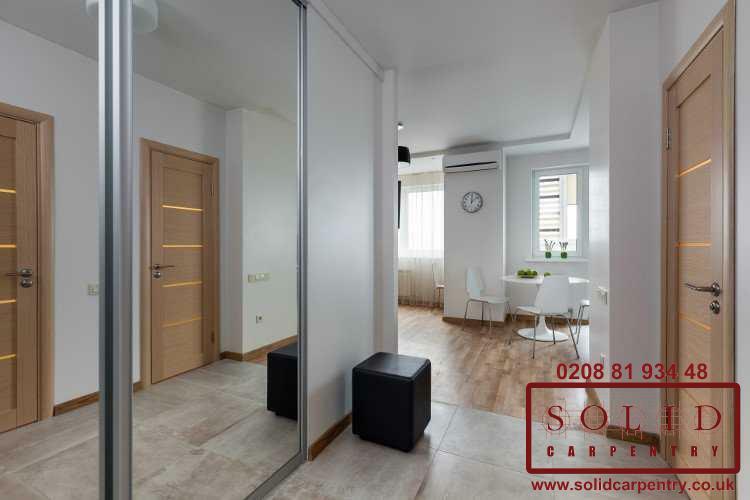 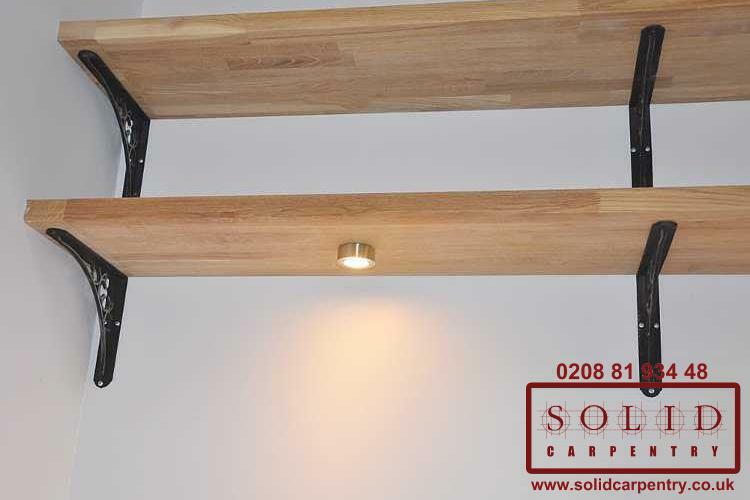 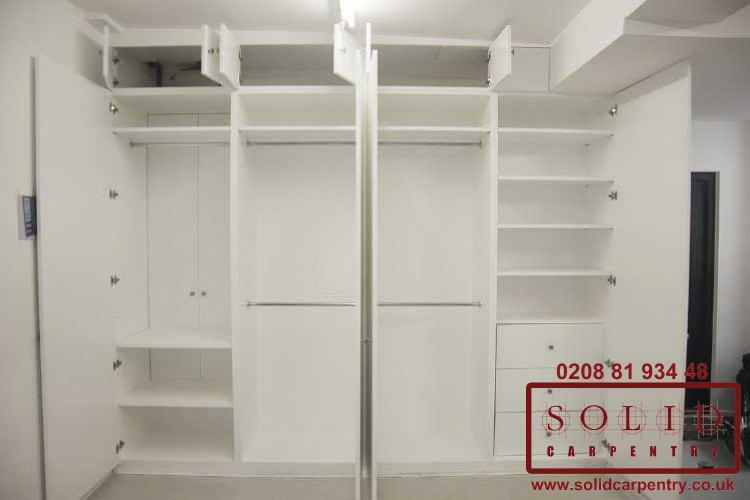 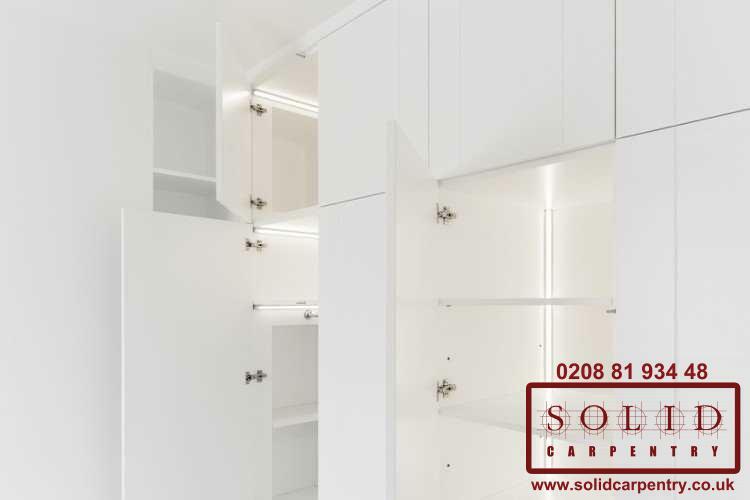 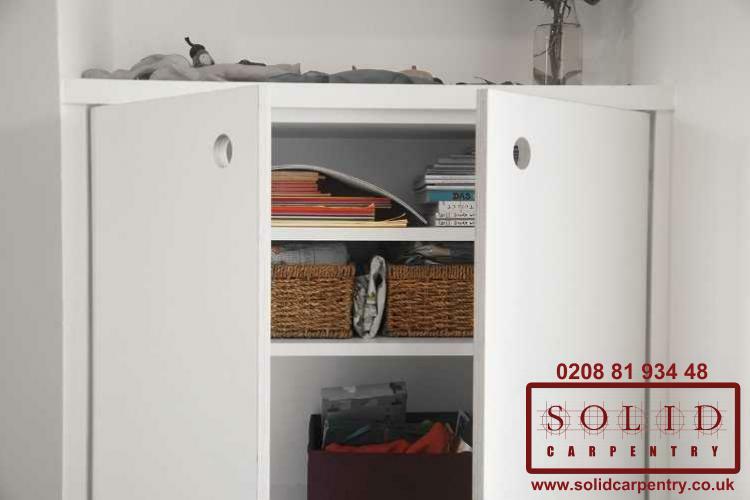 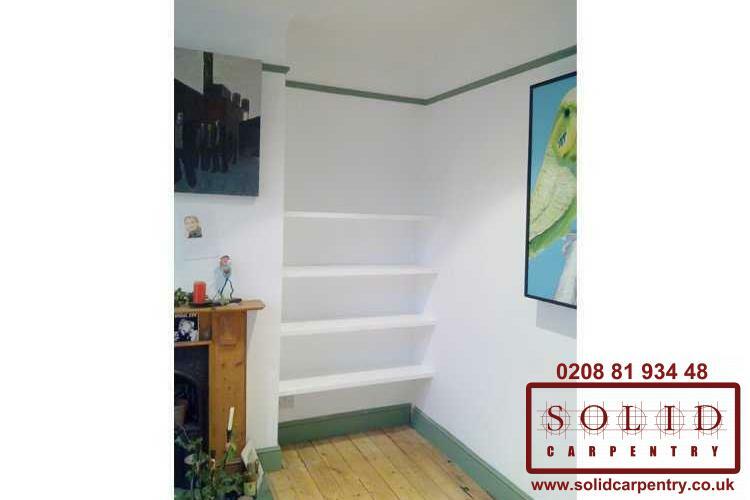 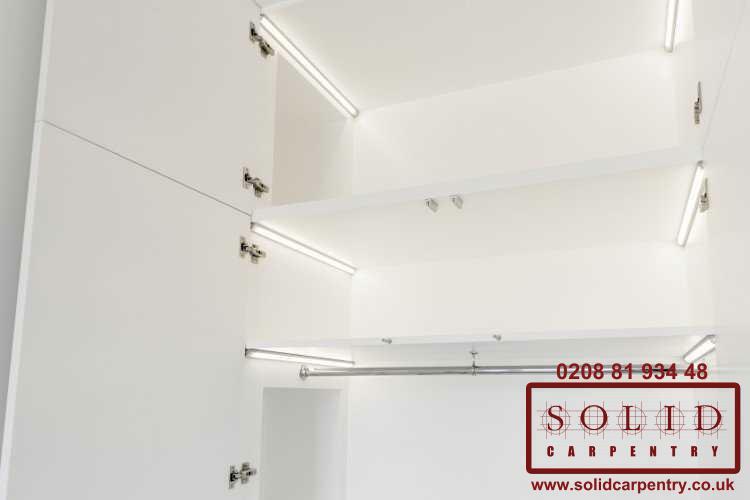 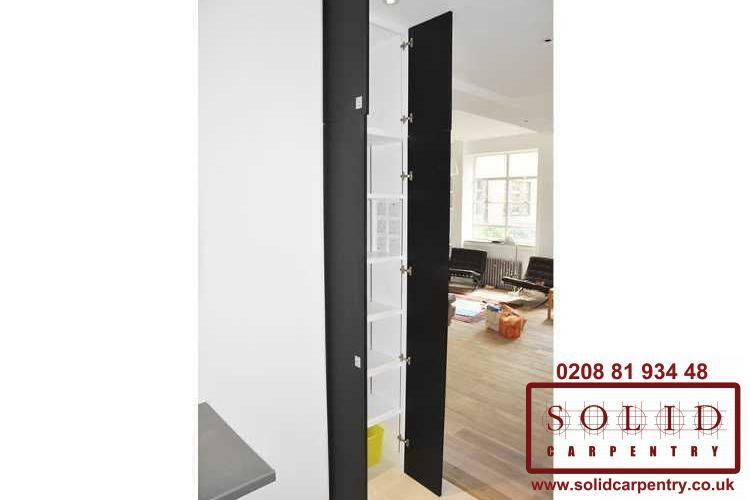 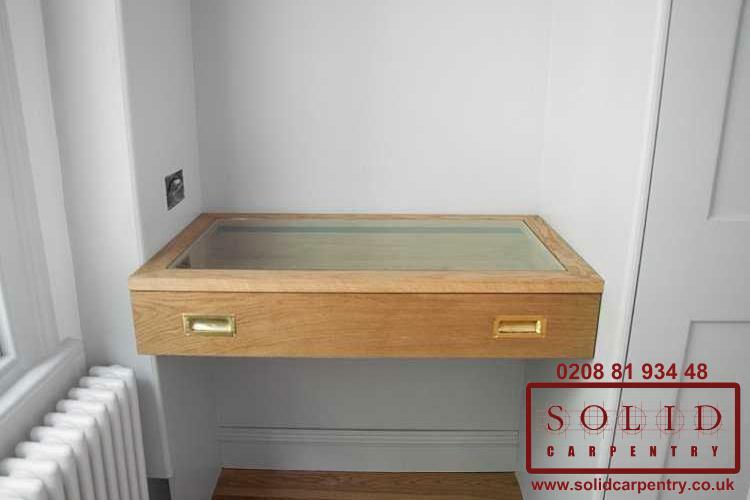 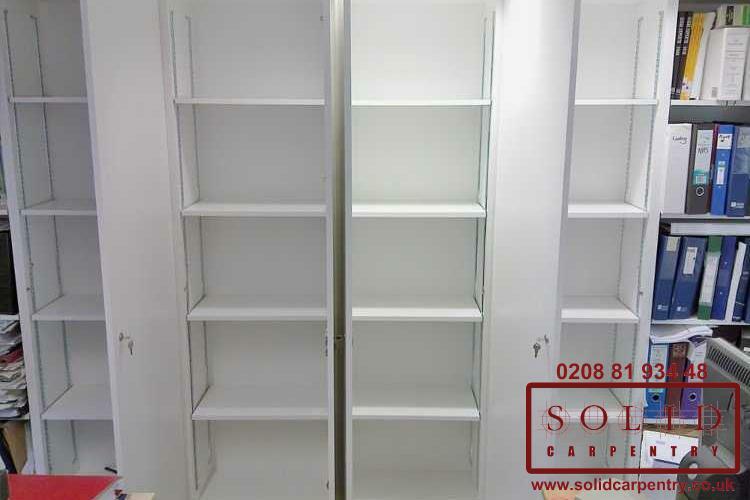 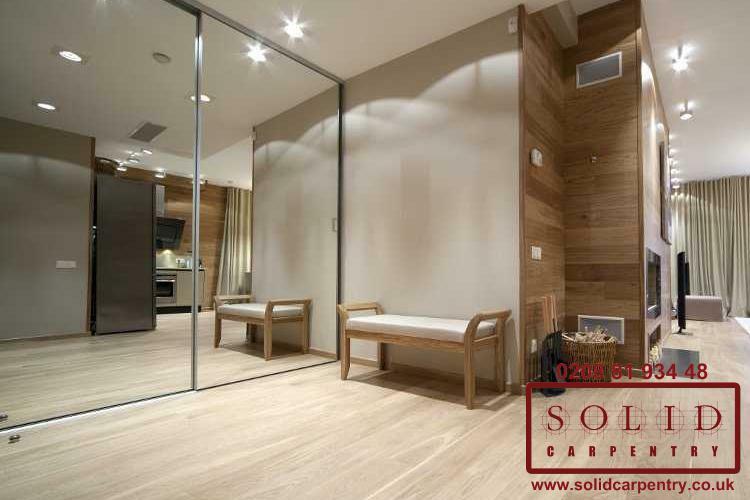 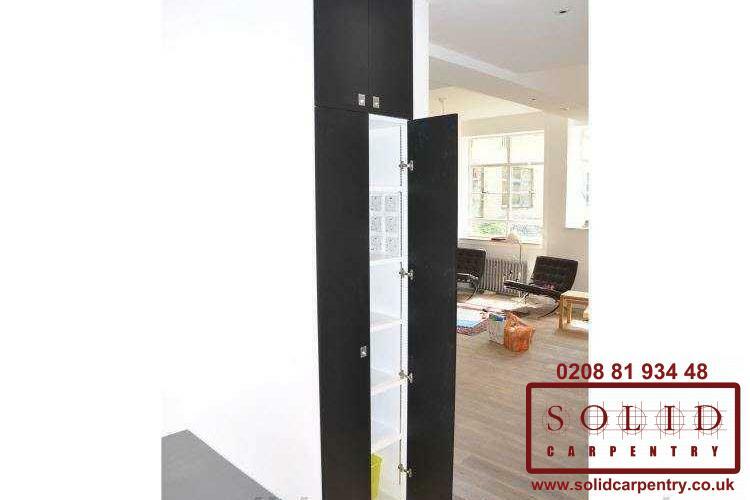 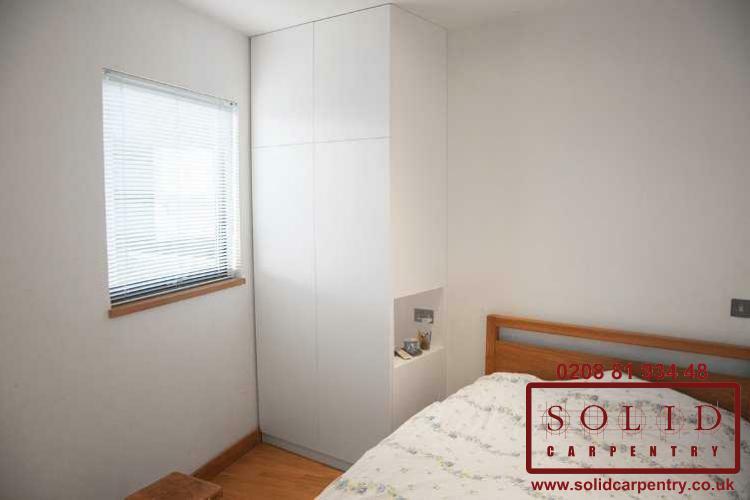 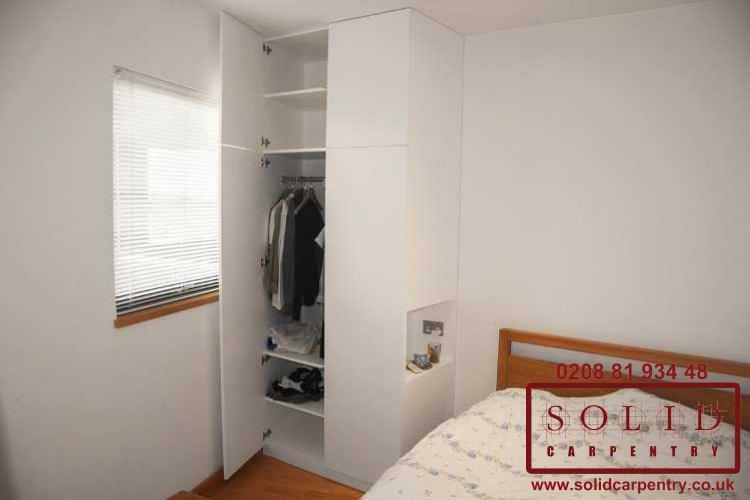 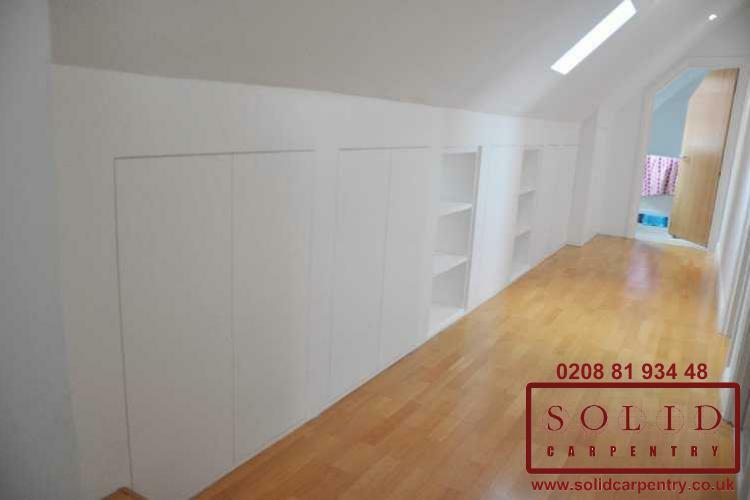 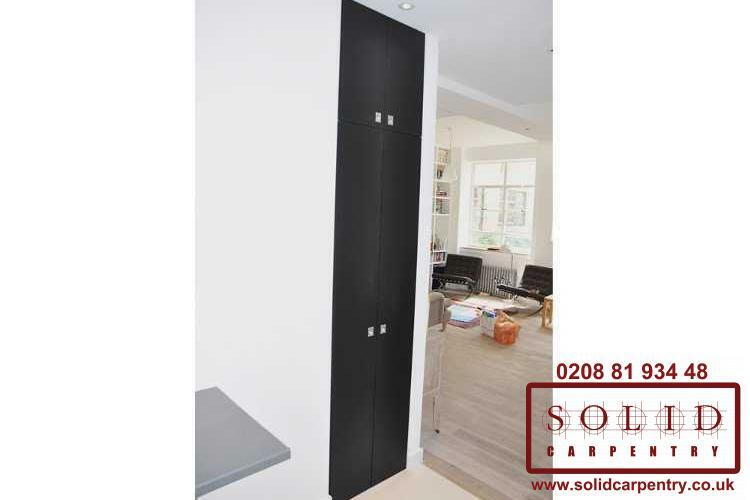 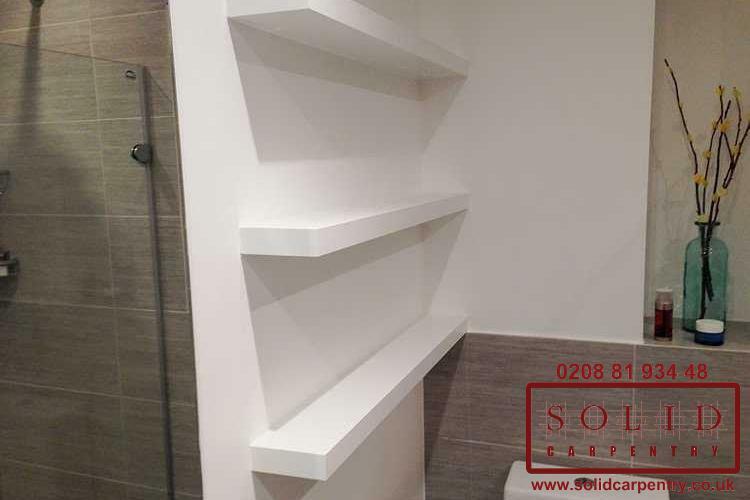 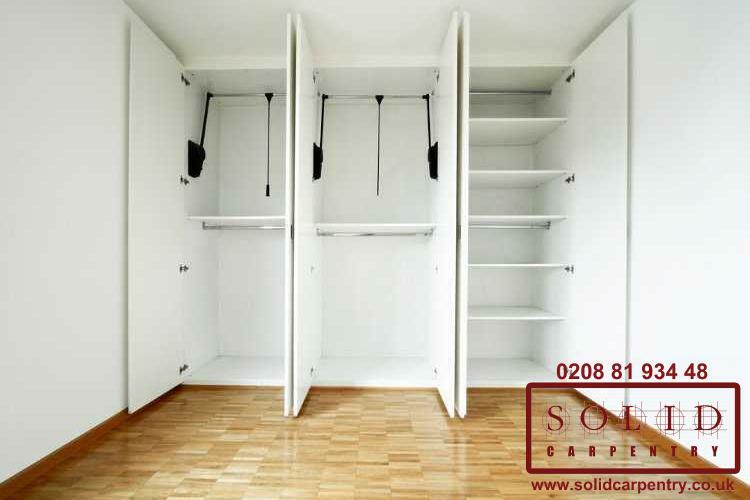 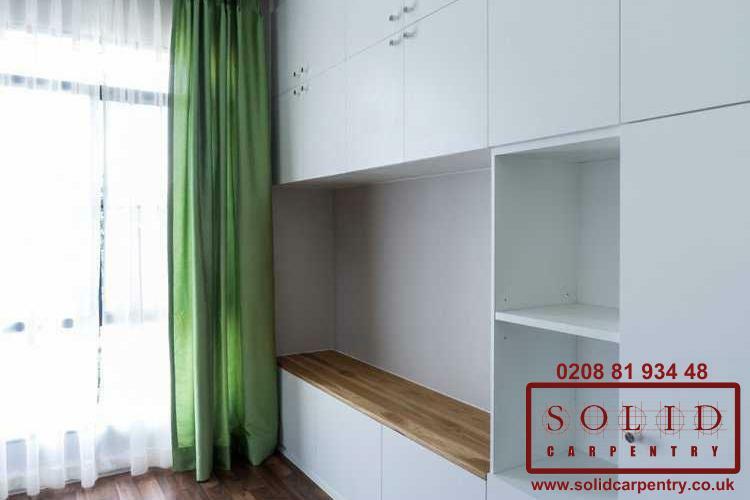 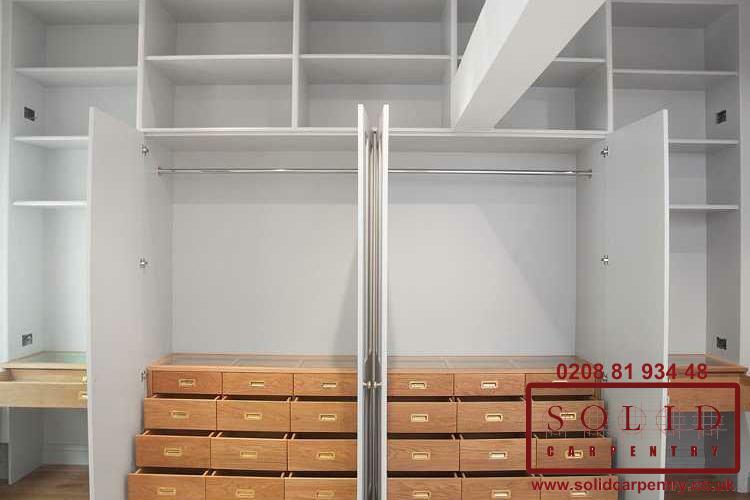 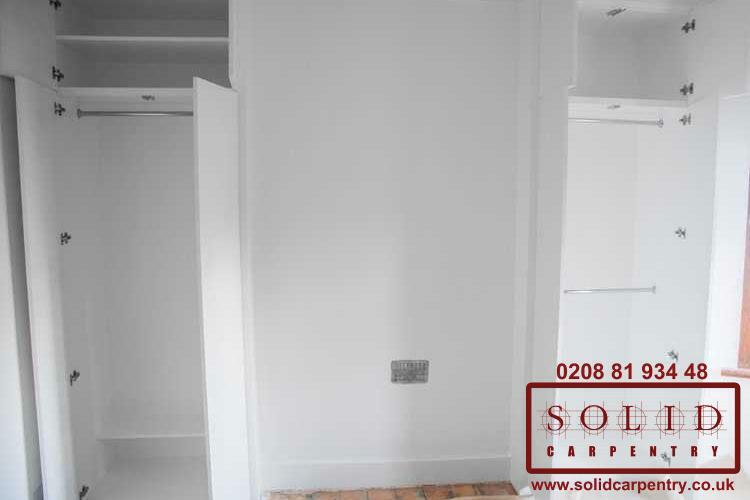 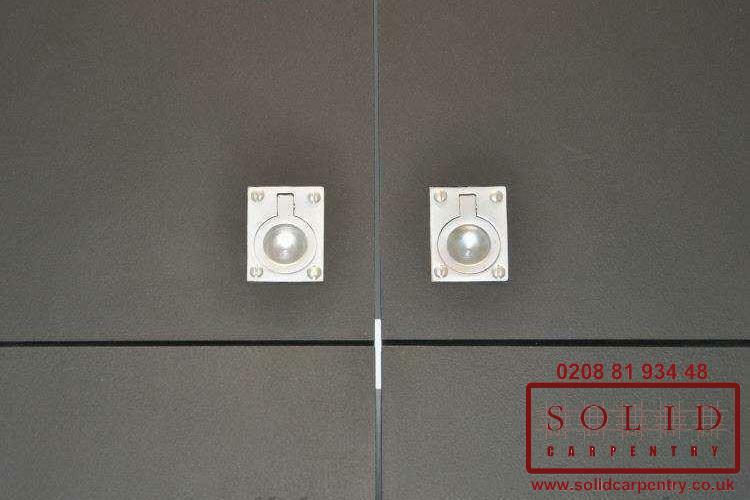 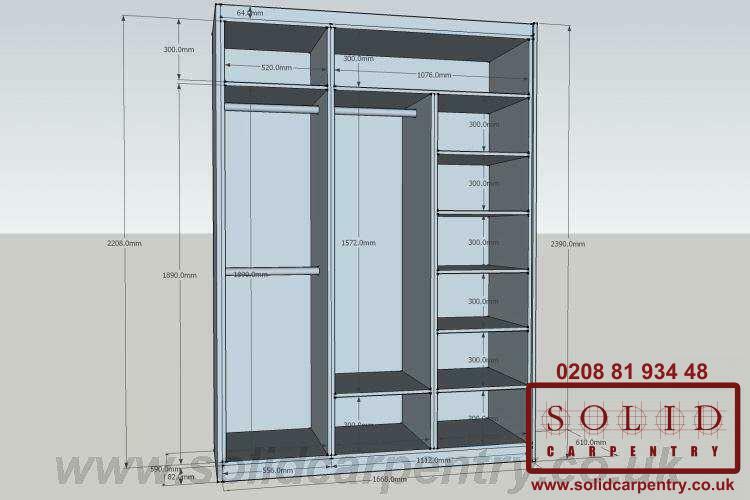 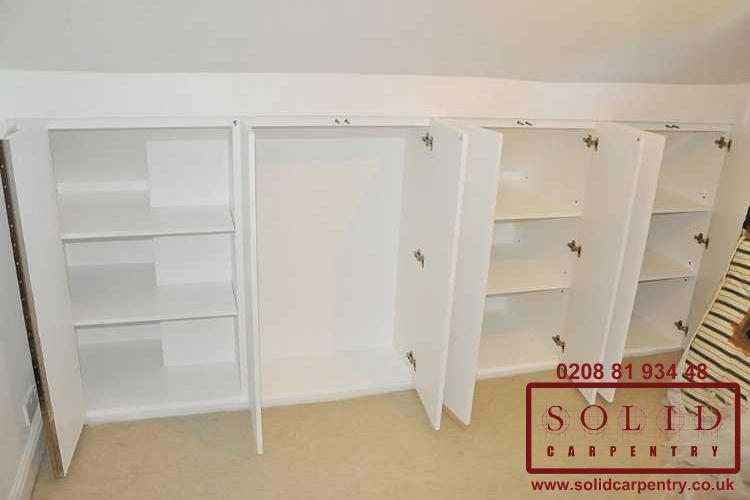 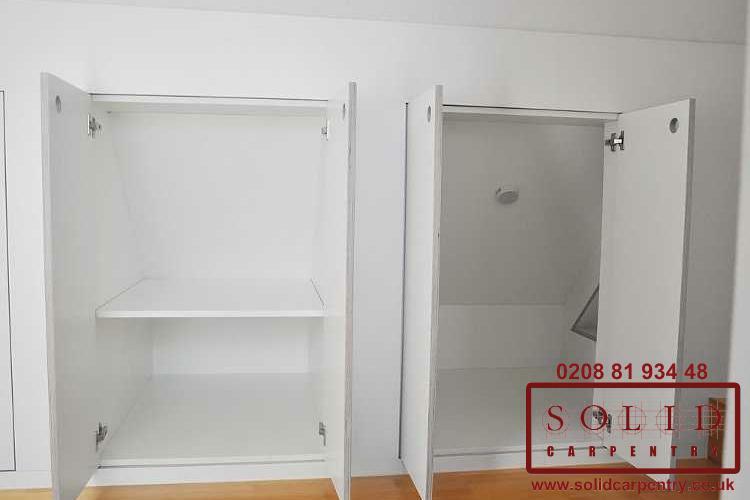 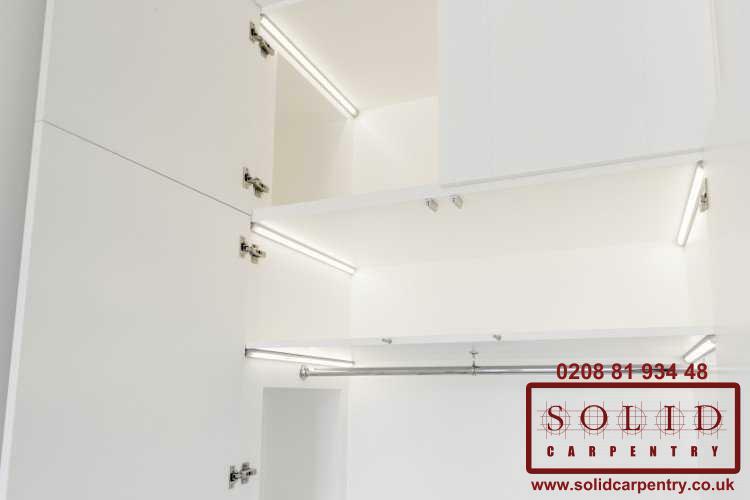 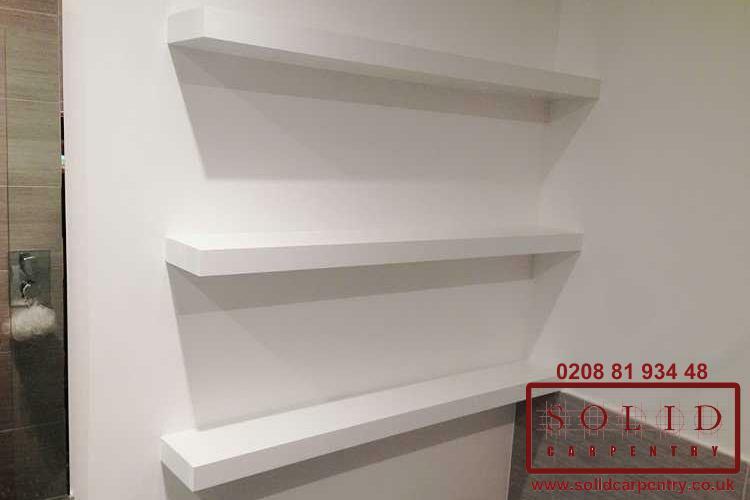 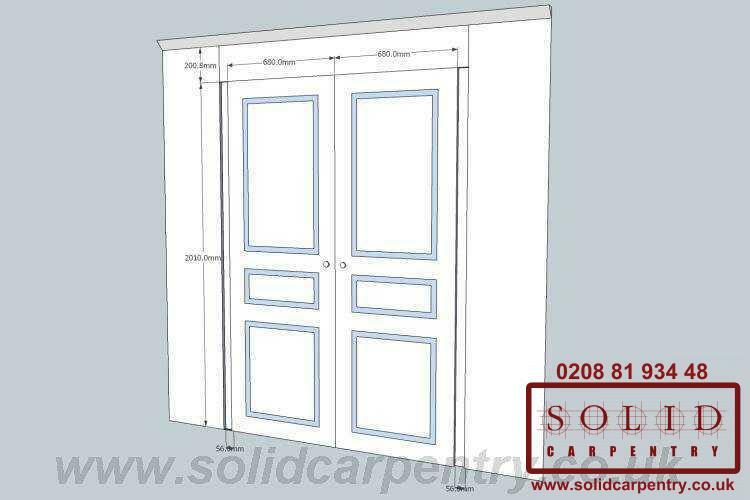 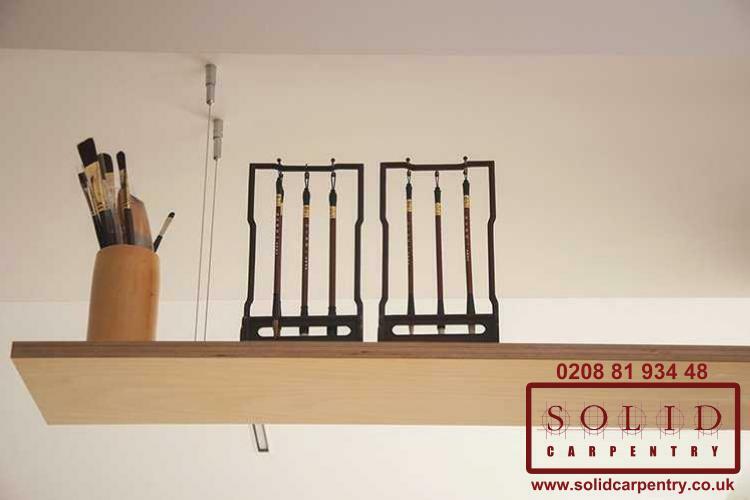 Drawing upon more than 15 years’ experience designing and installing bespoke fitted wardrobes for homeowners across London, Solid Carpentry can specifically design a made to measure wardrobe for you to perfectly fit in any area or unused space. 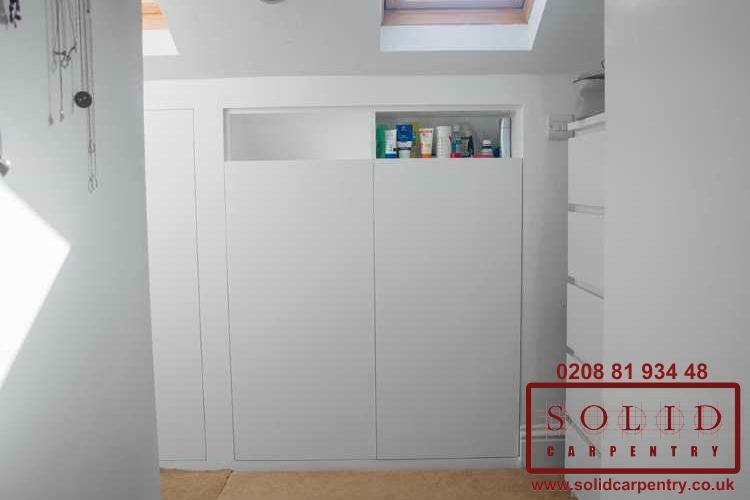 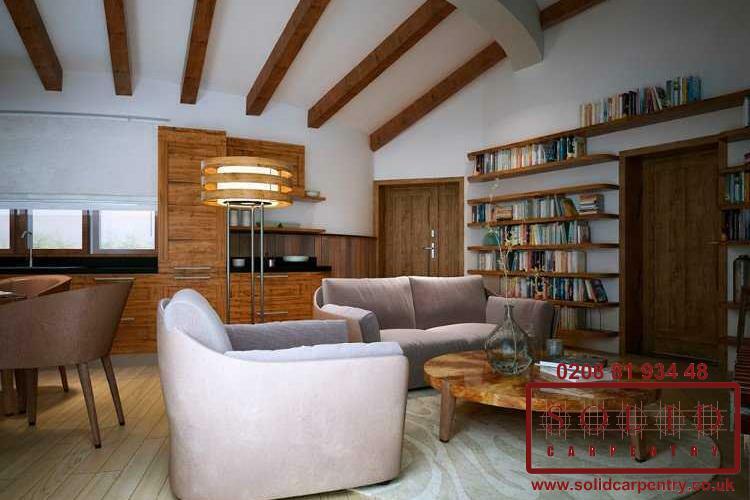 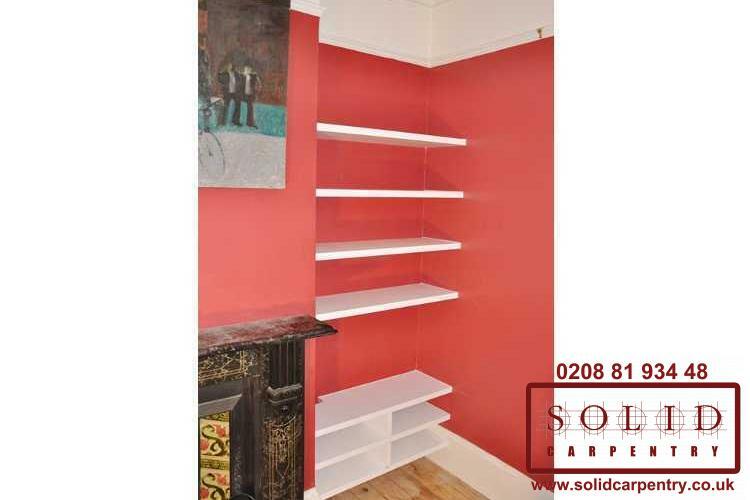 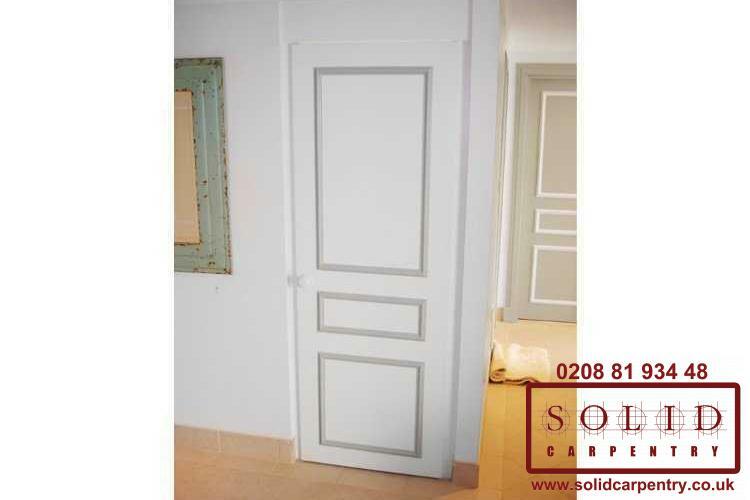 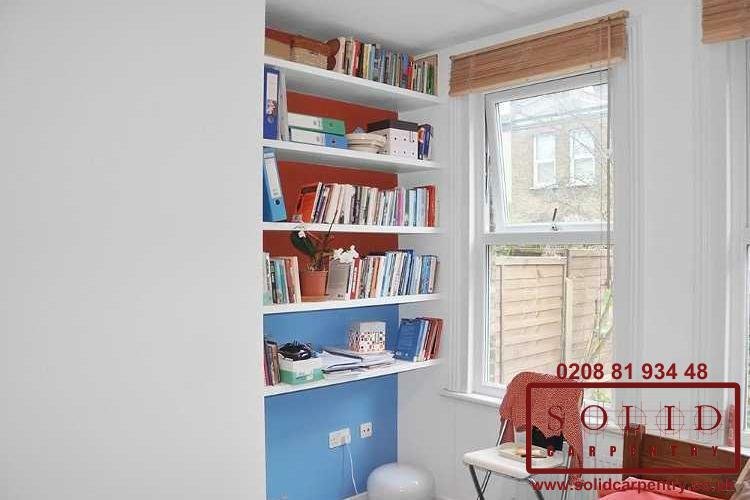 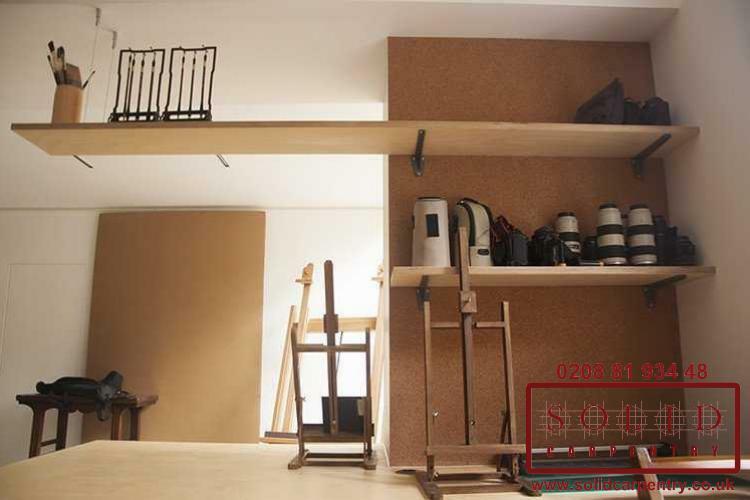 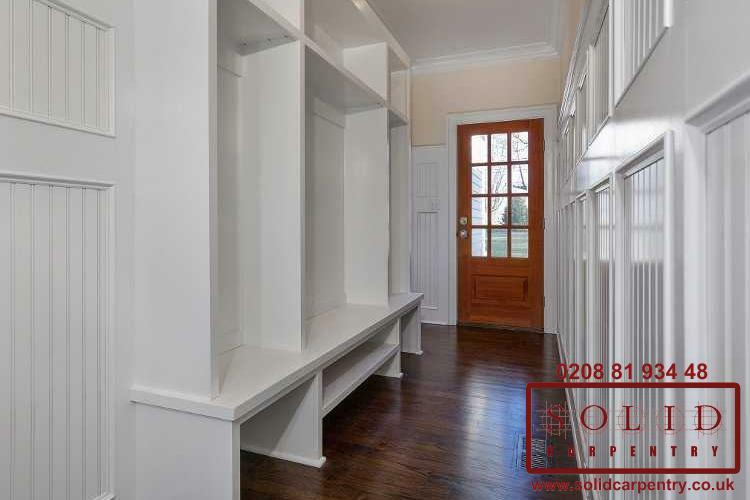 Without gaps or open spaces around the cupboard, it will seamlessly blend within your room. So not only will it look stunning, our built-in wardrobes will also provide stylish storage solutions tailored to your individual needs. 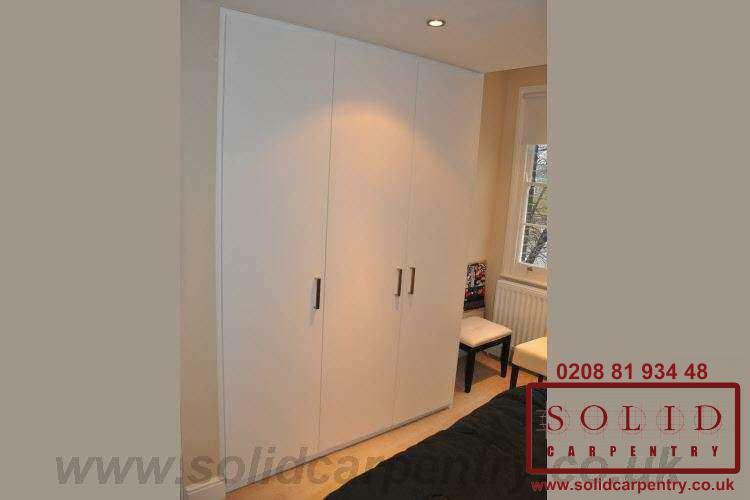 To see examples of previously installed built-in wardrobes we have completed, please visit our portfolio page. 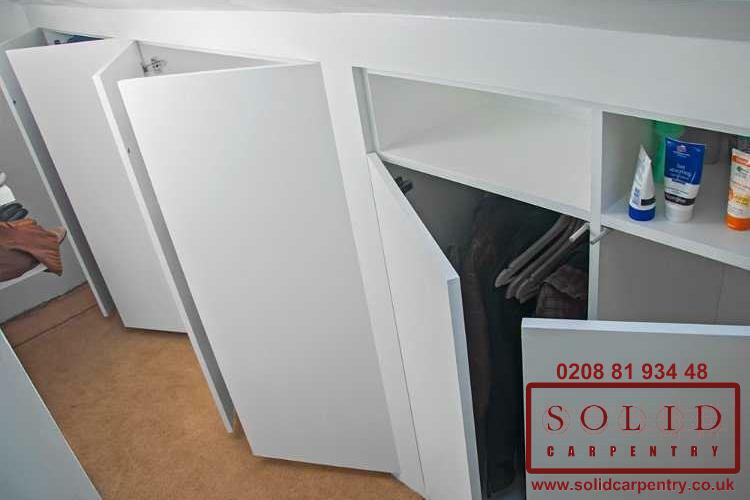 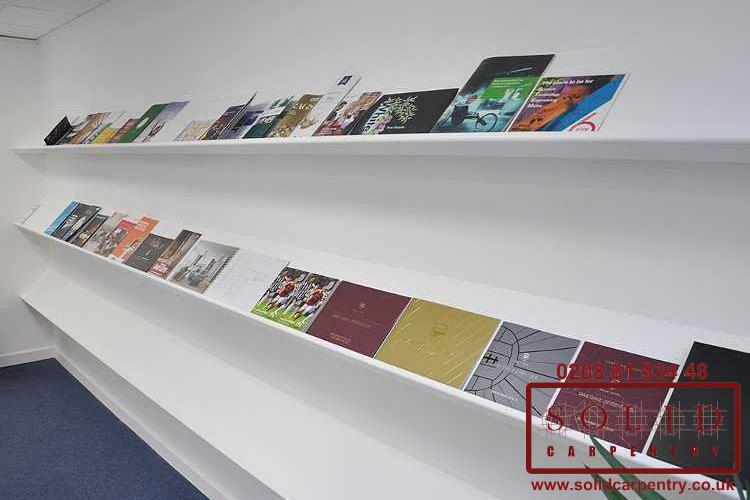 Here you will see how we worked closely with the customer to create a unique fitted wardrobe system designed to meet their individual needs and finished in way that complemented their room. 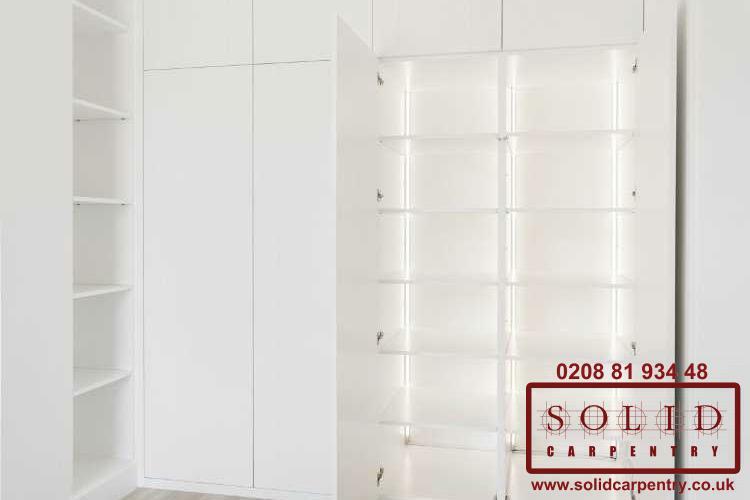 Made to measure wardrobes, when built-in properly, can also benefit your home interior design. 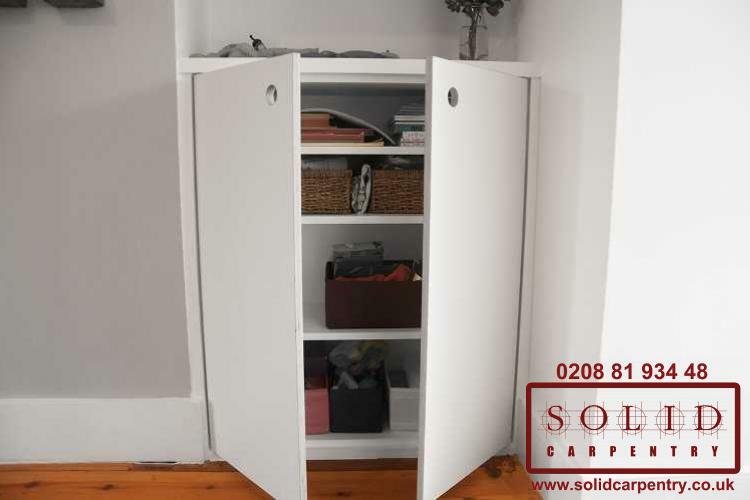 This is especially true for rooms with limited space or those that are not intended to incorporate additional, free-standing furniture pieces. 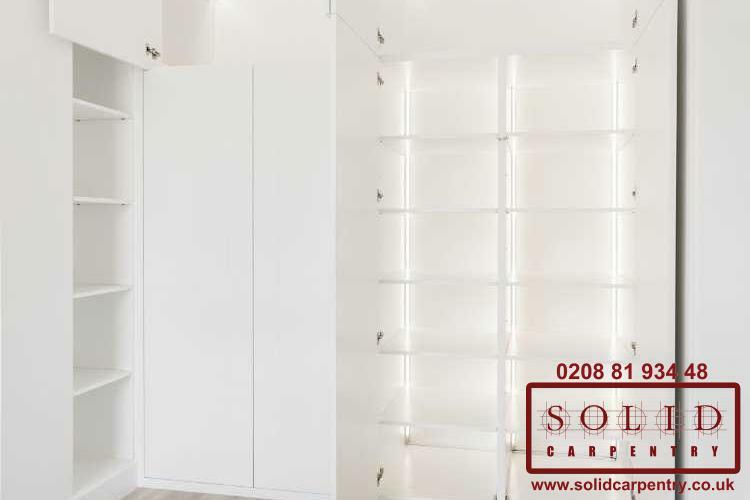 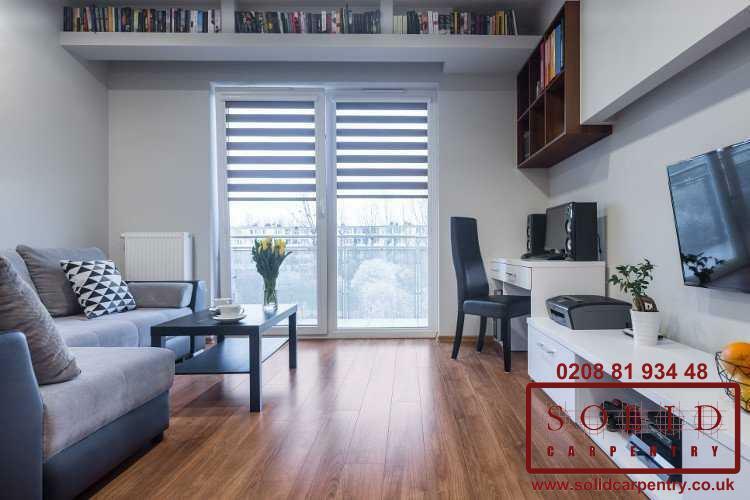 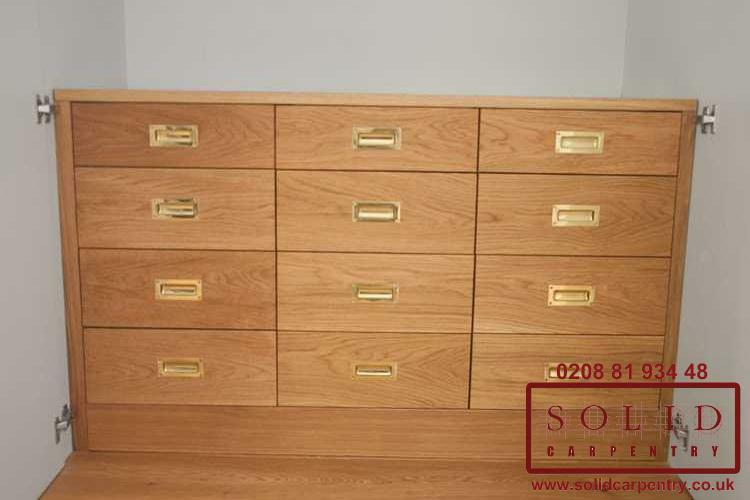 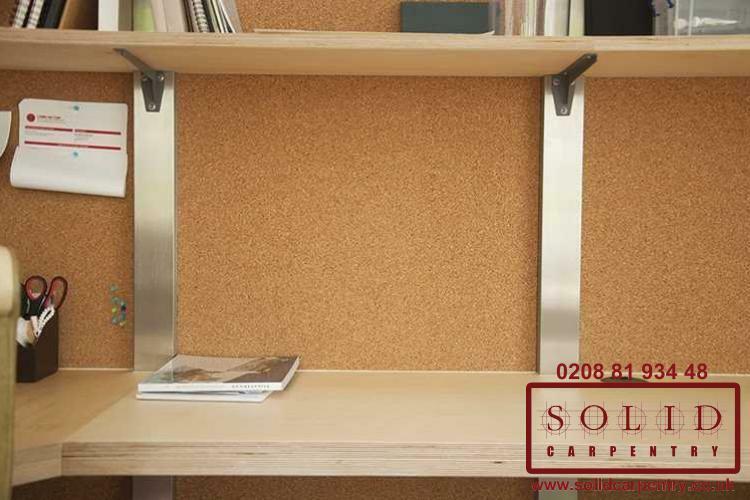 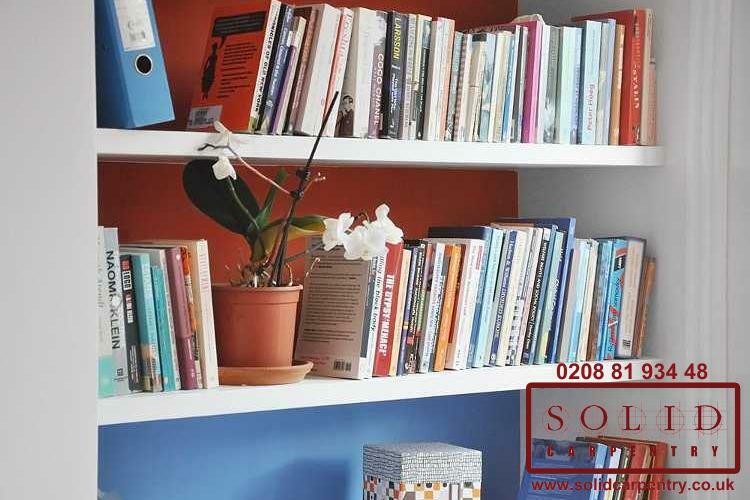 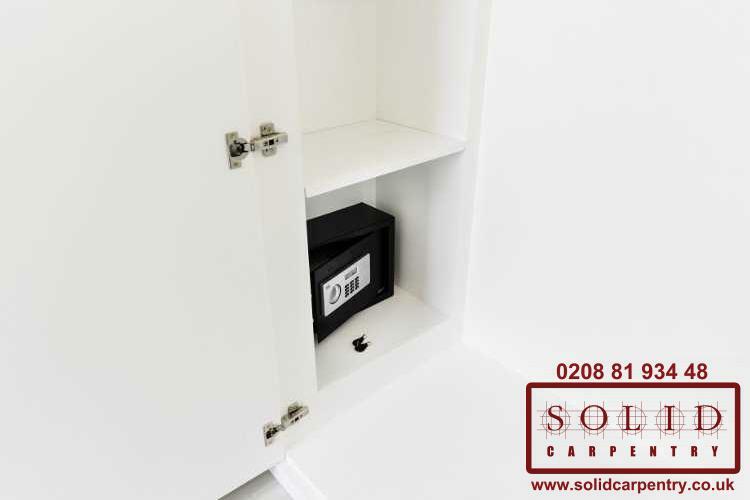 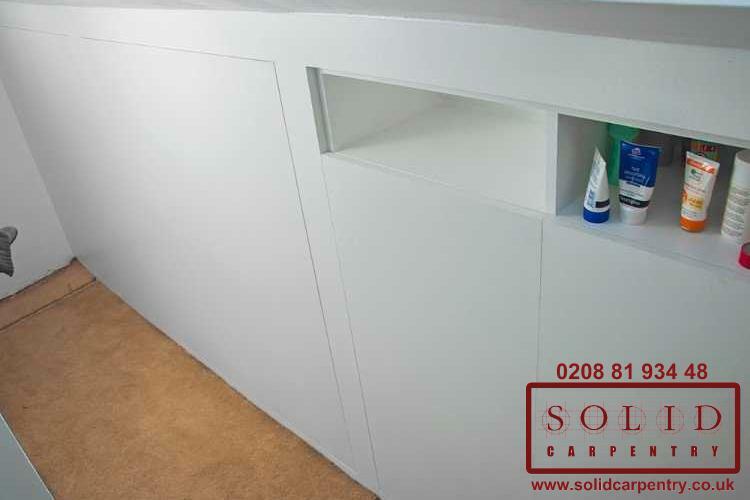 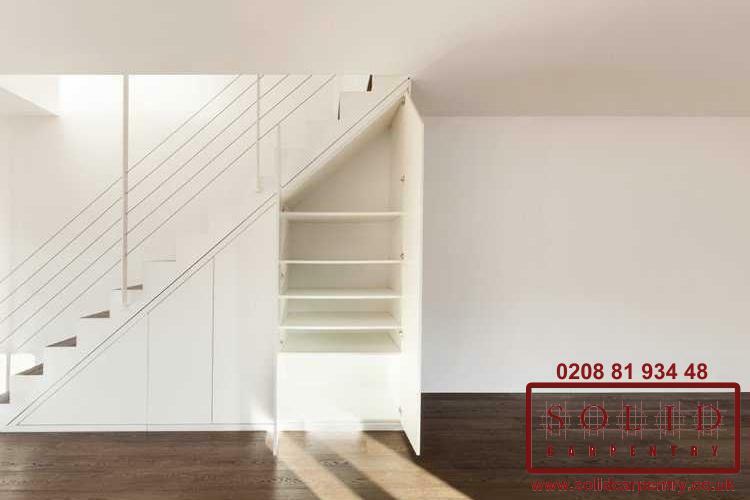 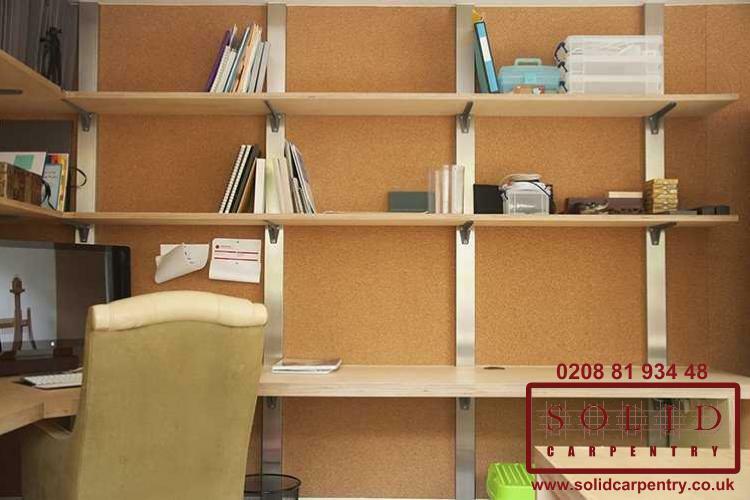 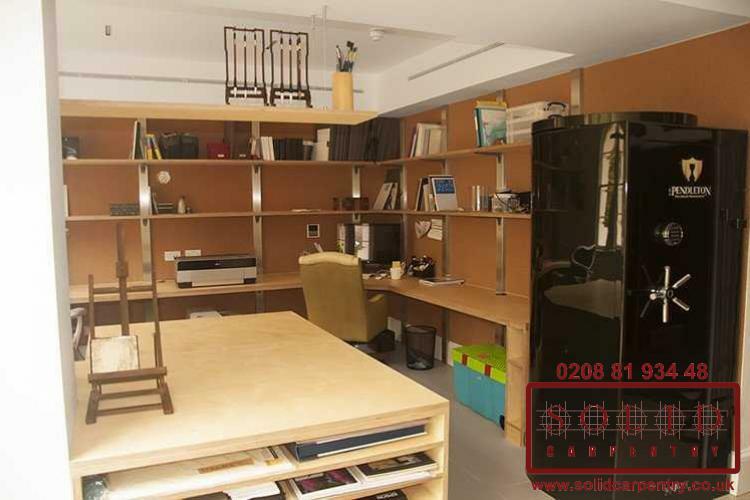 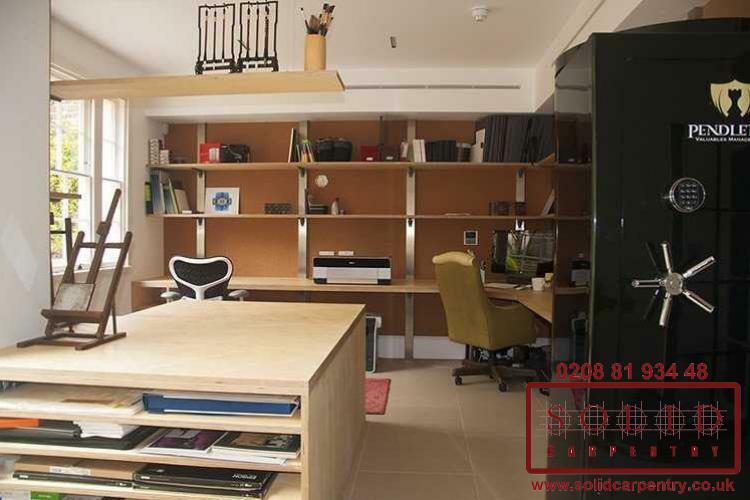 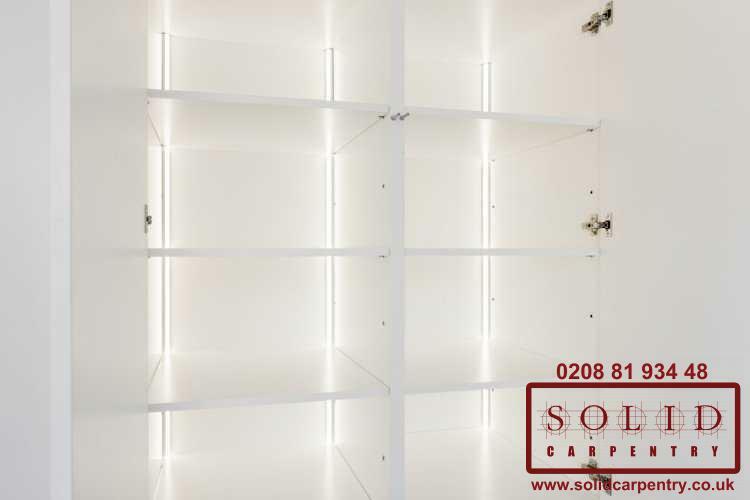 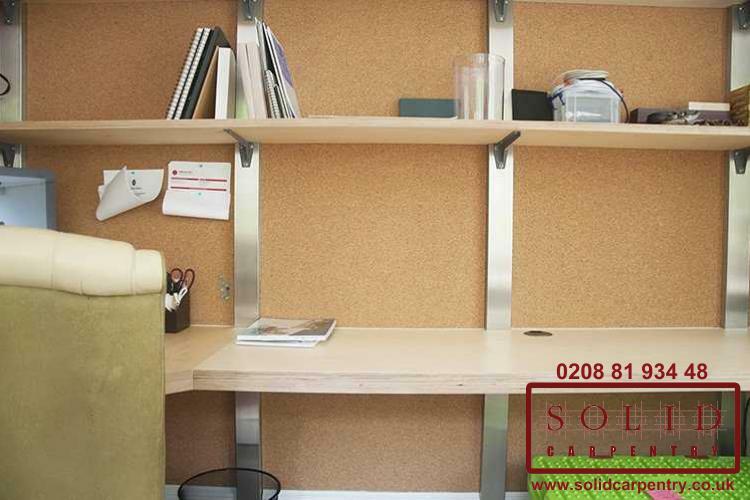 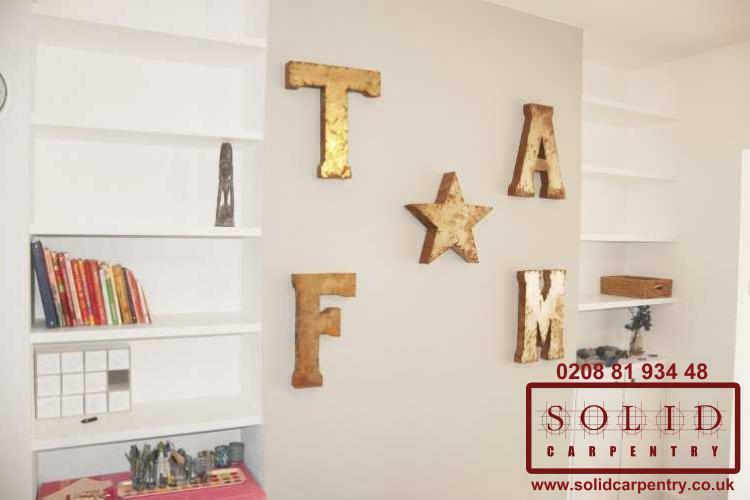 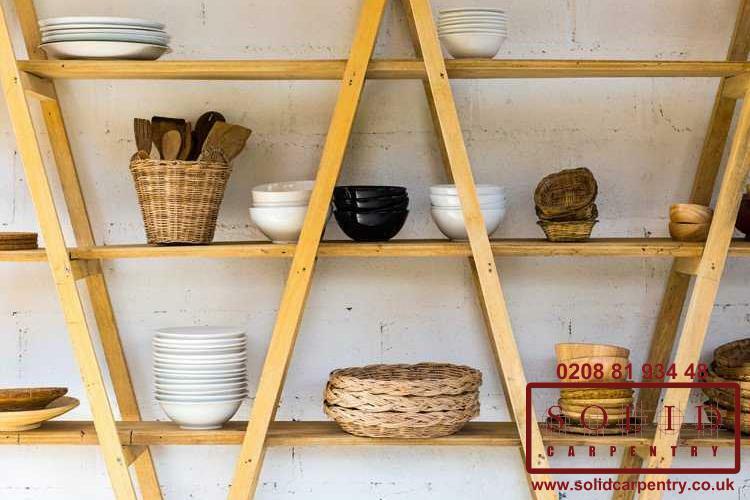 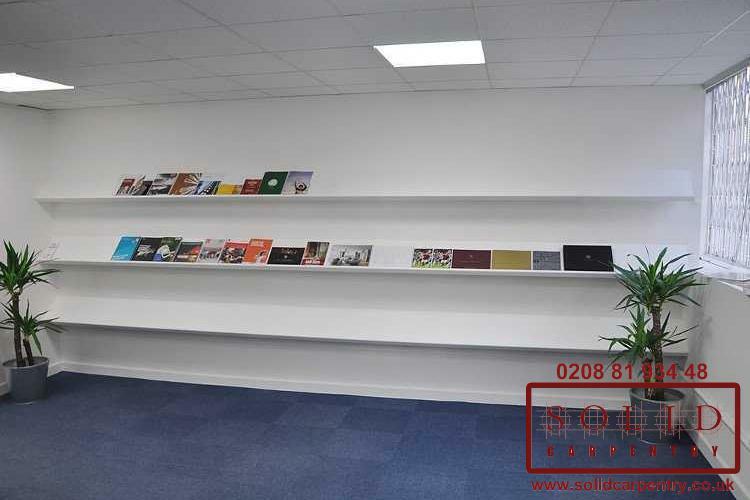 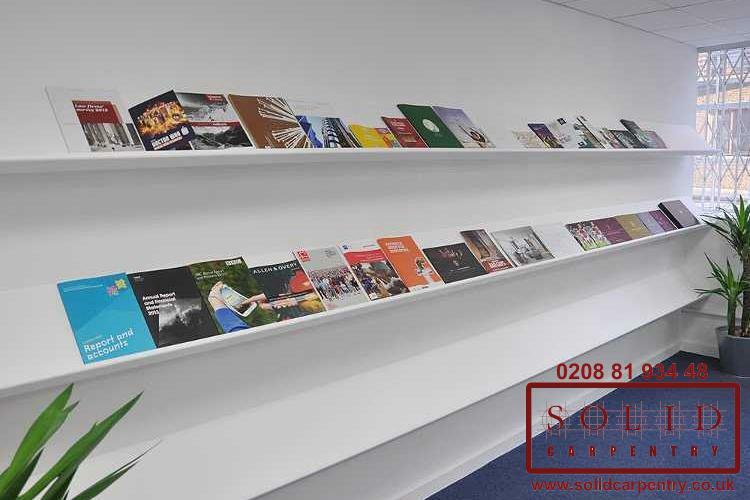 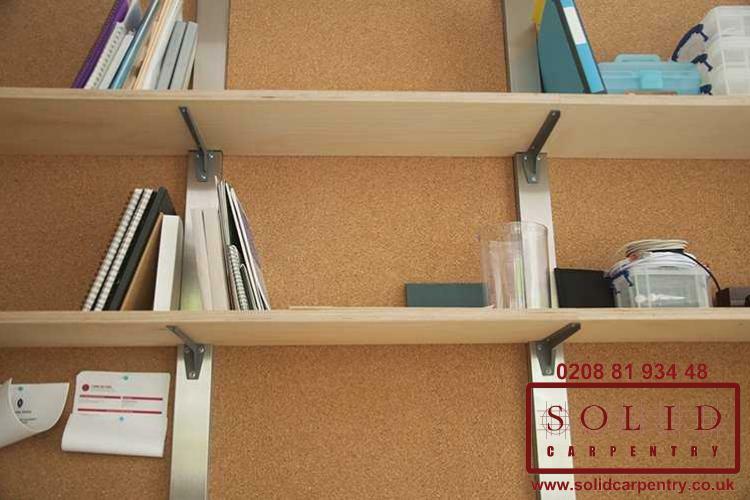 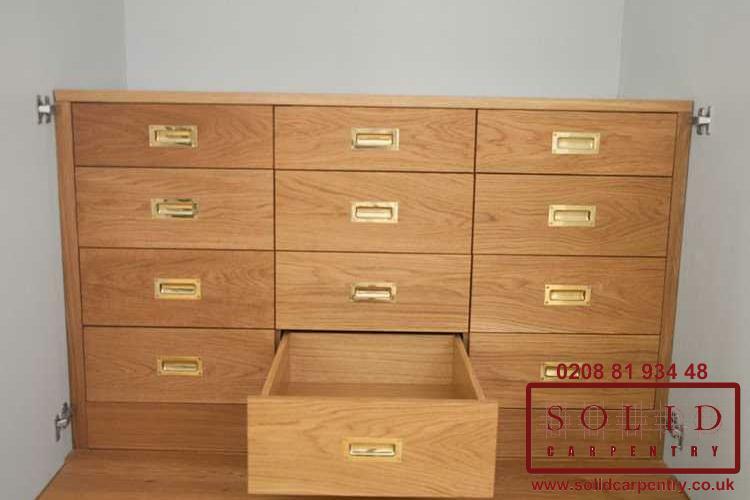 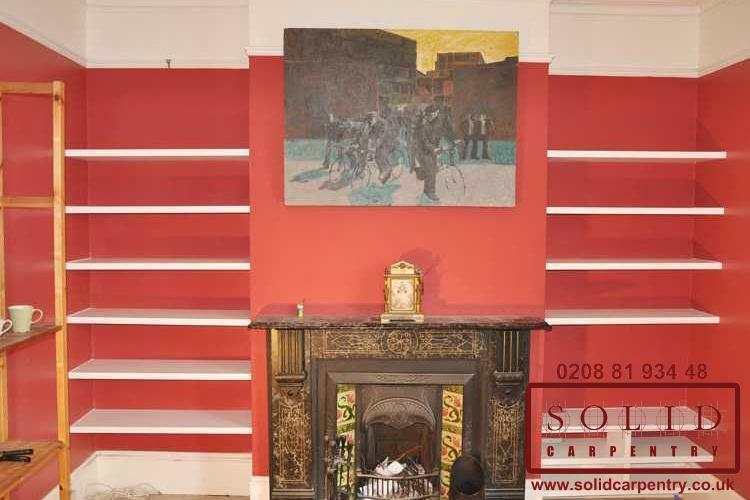 Contact us or call 0208 819 3448 today to learn more about how our bespoke storage furniture in London can meet all your specific needs.